Gene transfer into embryonic brains using in utero electroporation technique . Electroporation for mammalian embryos in the whole embryo culture system . (1) A 2 cm midline incision is then made in the abdominal wall along the linea alba using a set of forceps and scissors. A piece of sterile gauze with a hole cut in the center is placed over the incision, and one uterine horn is drawn out through the hole in the gauze. 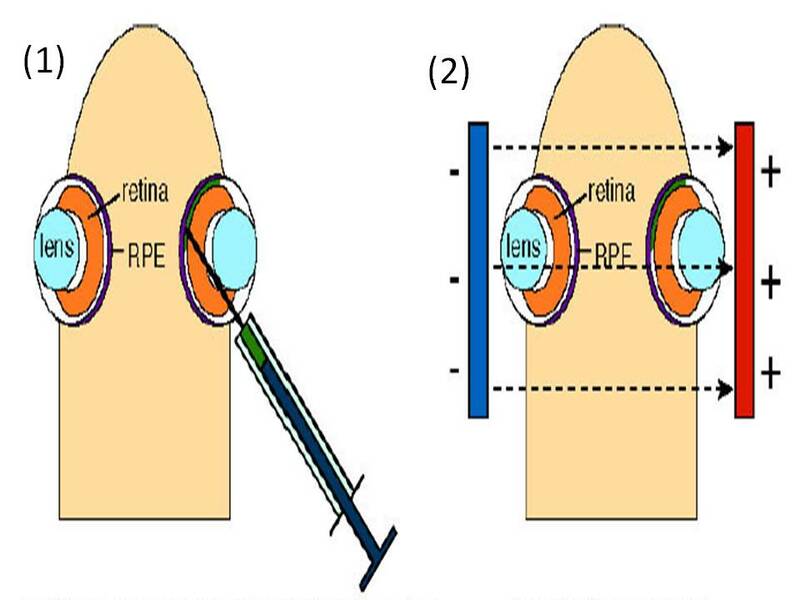 (2) After observing the orientation of the embryos through the wall of the uterine horn, a micropipette is inserted into the lateral ventricle, and 2-5μl of plasmid solution is injected by expiratory pressure using the aspirator tube assembly. When CAG-EGFP is used, a concentration of 1μg/μl is sufficient to visualize the migrating neurons. (3) After the injection, DNA solution containing 0.01% FastGreen can be seen through the uterine wall ( ). 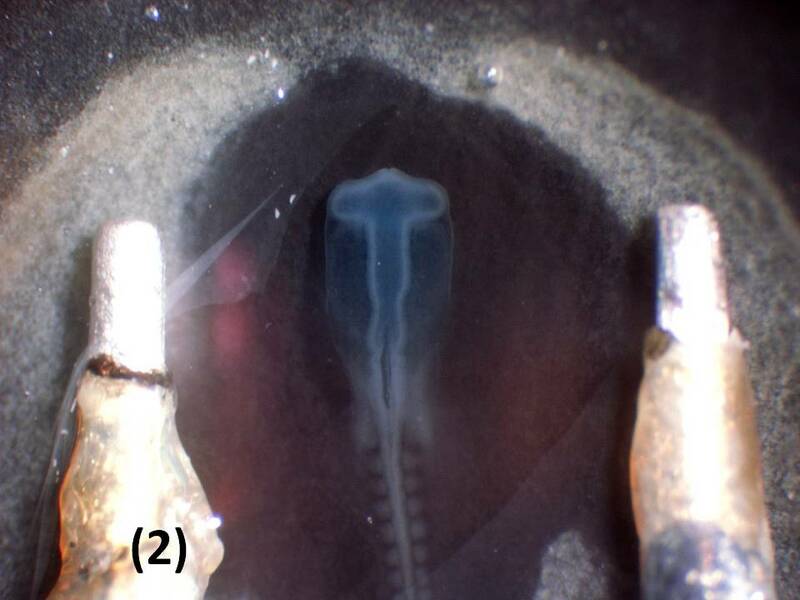 (4) After soaking the uterine horn with PBS, the head of embryo is pinched with a tweezers-type electrode, and electronic pulses are applied with the electroporator. (5) Electroporation parameters for ICR mouse. 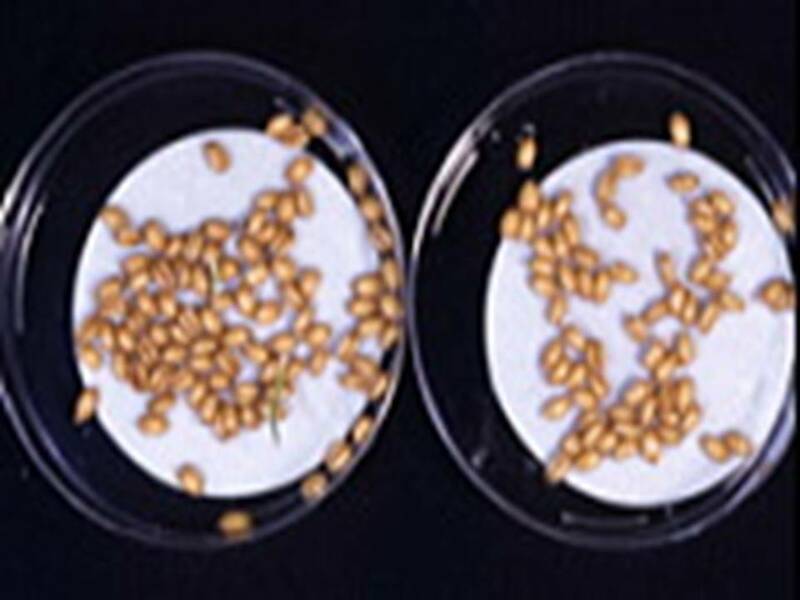 If viability was prioritized over transfection efficiency, the number of pulses can be changed to two. 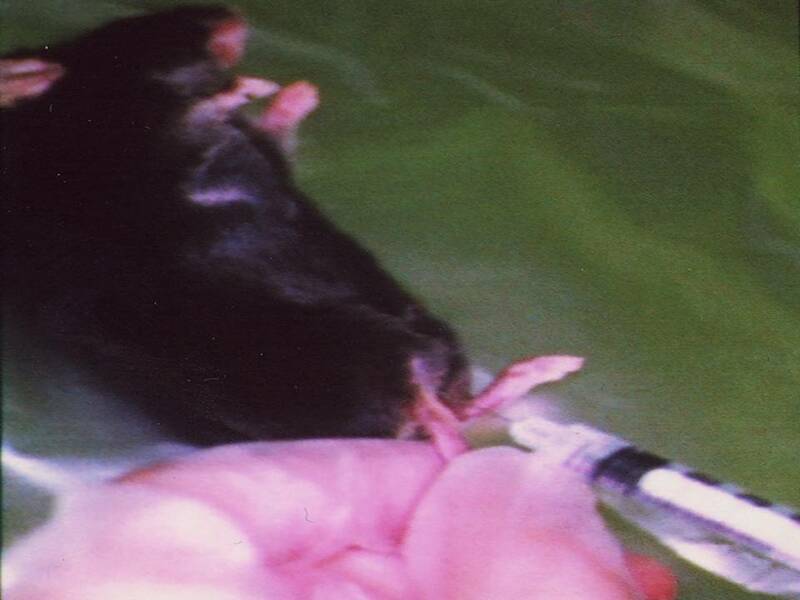 CAG-EGFP was injected into the both lateral ventricles of E14.5 mouse embryos and electronic pulses (33V, 50msec) were charged four times. 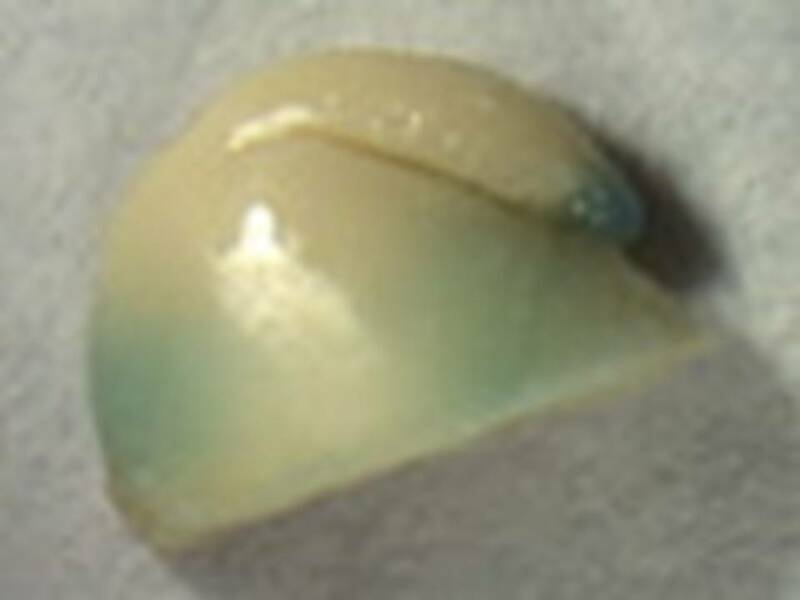 3 days later, the embryos (E17.5) were fixed and the brains were removed and examined under a fluorescence stereomicroscope (Fig. A). 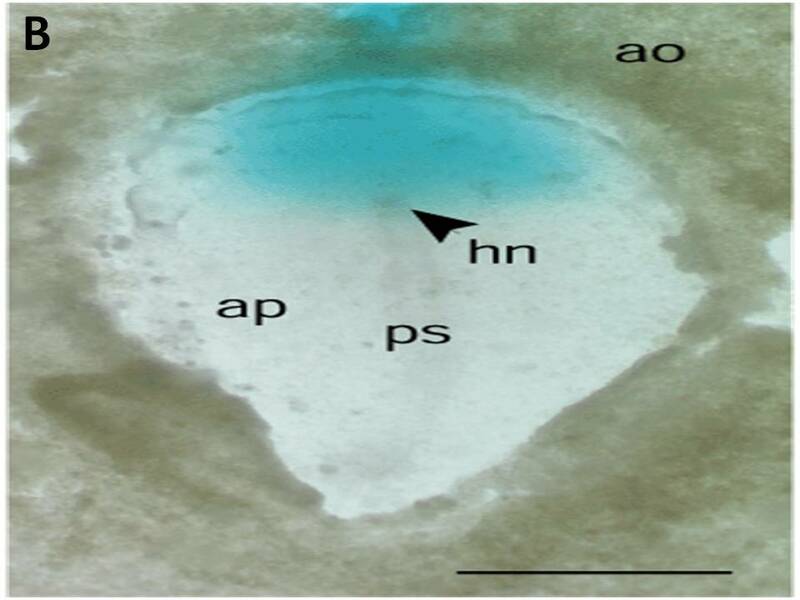 Fluorescence was observed in the lateral region of the hemisphere onto which the anode had been placed and in the medial region of the opposite hemisphere. 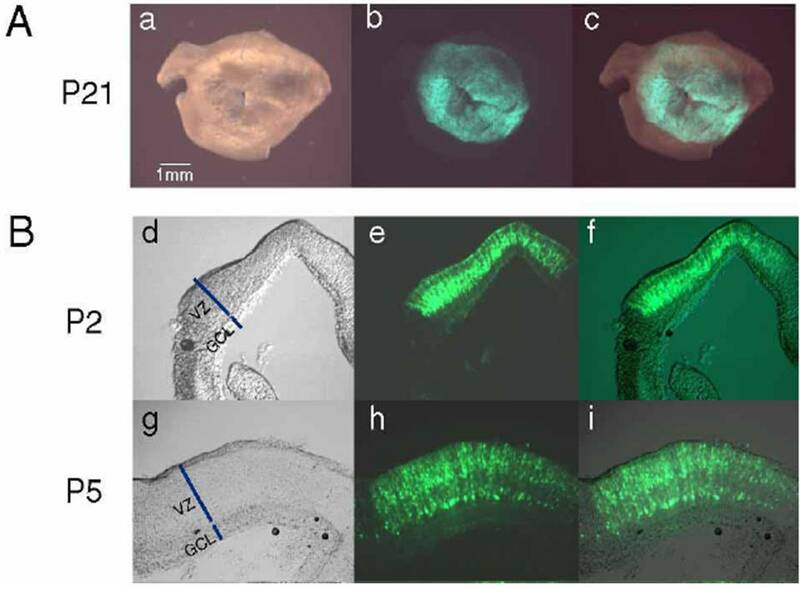 And brains were frozen and sliced and the fluorescent image was obtained with a confocal laser microscope (Fig. B). GFP positive cells into which DNA was transferred at the ventricular zone (VZ) migrated to the intermediate zone (IZ) and cortical plate (CP). The arrowheads show the border between VZ and IZ and the border between IZ and CP. Dashed line show the border of tissues. 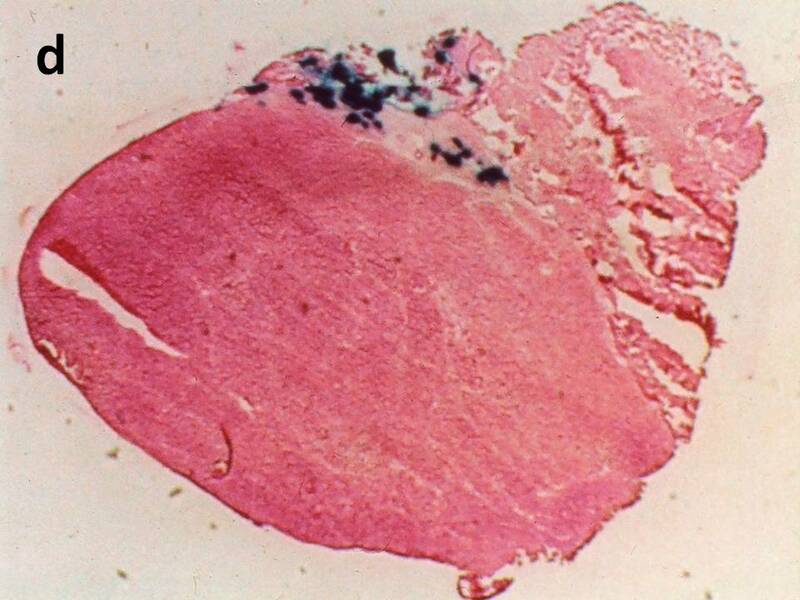 VZ: Ventricular Zone, IZ: Intermediate Zone, CP: Cortical Plate . 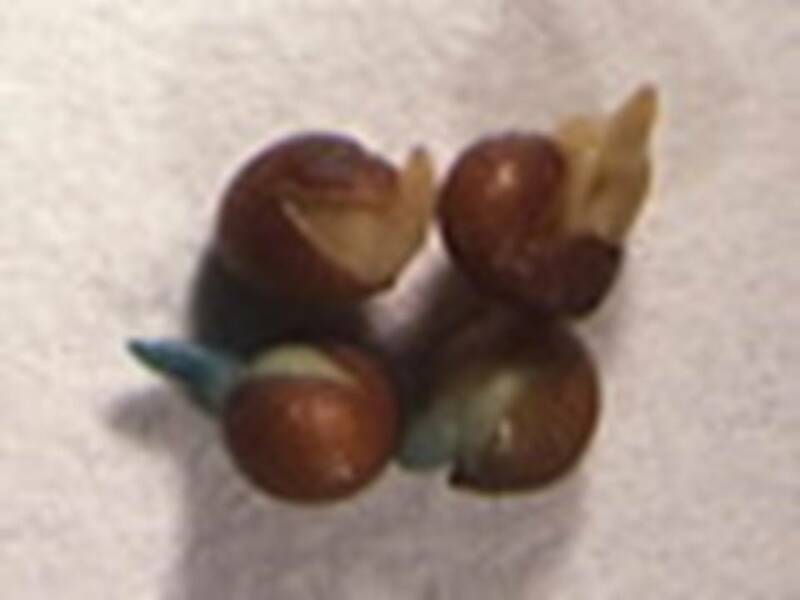 1 Pre-culture embryos in the whole embryo culture system for 1.5-2 hours prior to electroporation. 2 Place the embryo in a Petri dish with Tyrode’s solution 3 Inject 0.1-0.5 µl of plasmid DNA into the brain ventricle with a fine capillary. 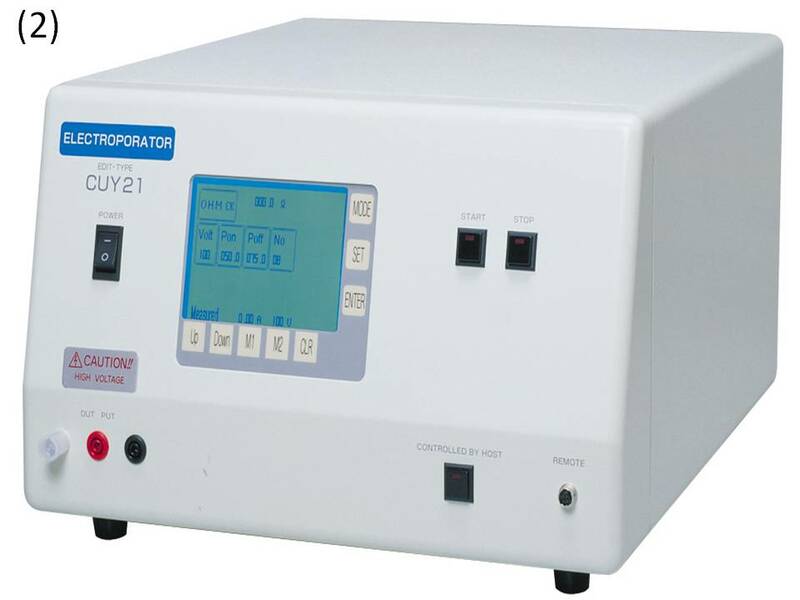 4 Apply square pulses using the electroporator (CUY21) and electrodes (chamber-type and forceps-type electrodes are available). 70V, 50 msec at 1-second interval, five pulses are applied for E10.5 mouse embryos. 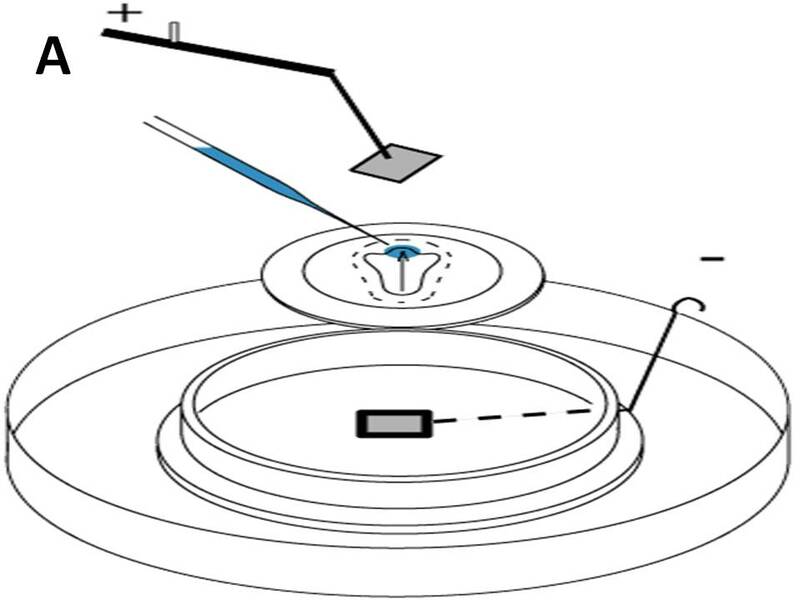 5 Culture the electroporated embryos for 24-48 hours in the whole embryo culture system. .
Schematic representation of an electroporation set-up. 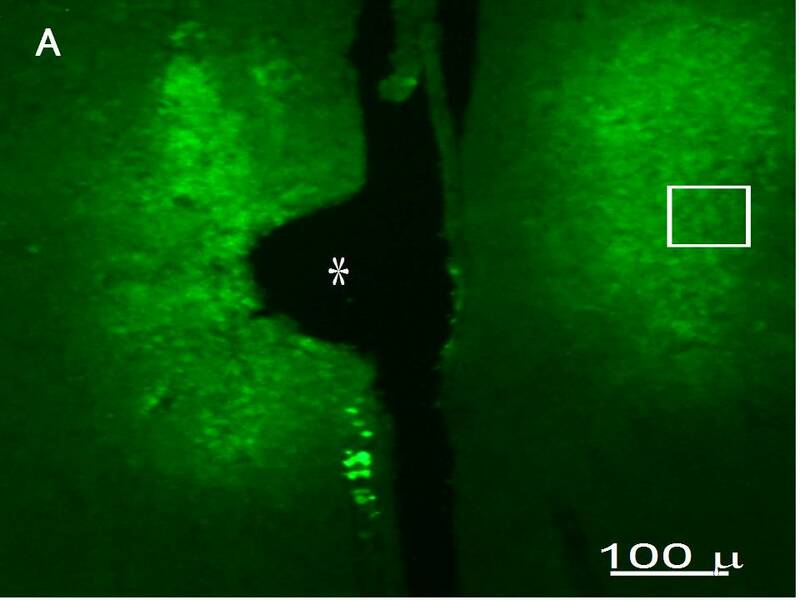 A fragment of the mouse embryonic hippocampus was placed on a Millipore membrane filter and 5µl EP buffer containing 1mg/ml of plasmid DNA was applied onto the tissue. A tungsten needle was attached to the surface of a droplet. 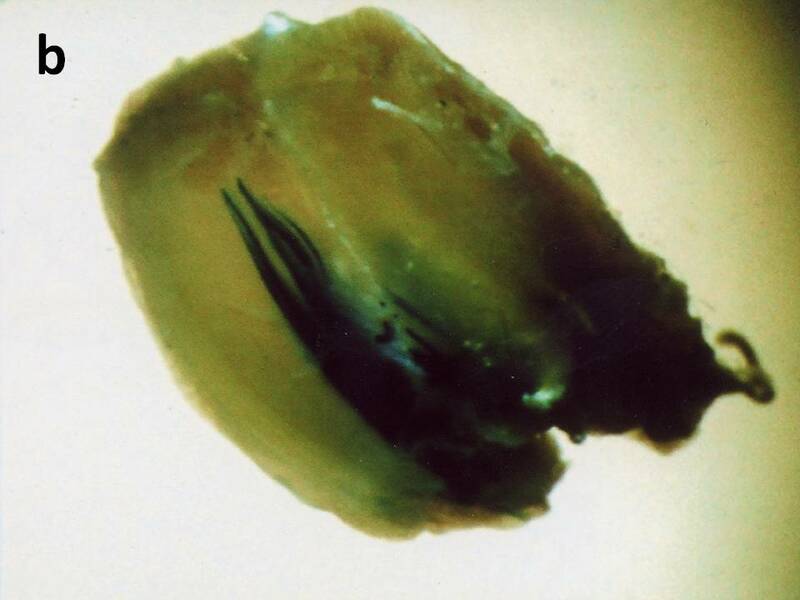 After application of square pulses the tissue fragment was returned to a petri dish containing ice-cold HBSS solution. 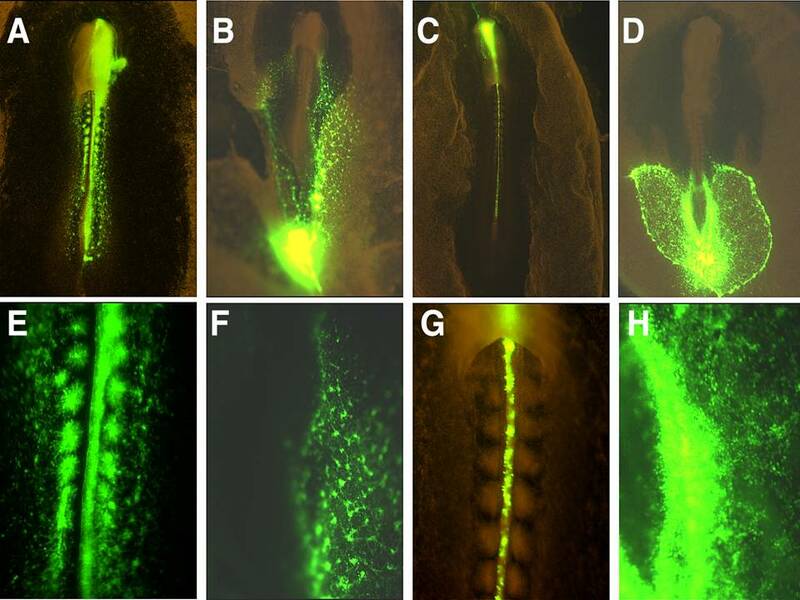 Electroporation-mediated expression of fluorescent proteins in hippocampal neurons. 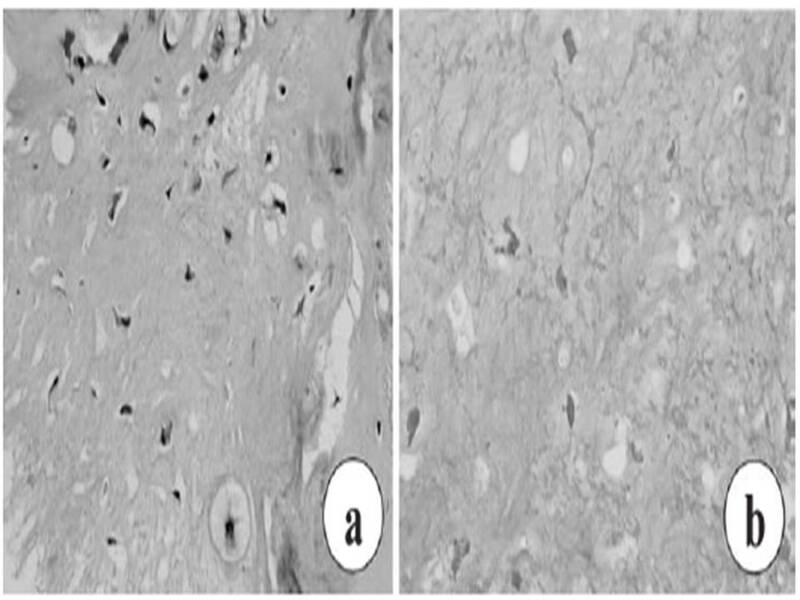 (a-c) Organ culture of hippocampal tissue fragments three days after electroporation with CAG-eGFP (a), T∞1X4 -eGFP (b), and ß-actin-eGFP (c) expression constructs. (d, e) A mature hippocampal neuron maintained 14 days in dissociated culture after electroporation of a ß-actin-eGFP expression construct. Higher magni¢cation view of the region marked by a rectangle in (d) reveals dendritic spines on the surface of dendritic shafts (arrows in e). 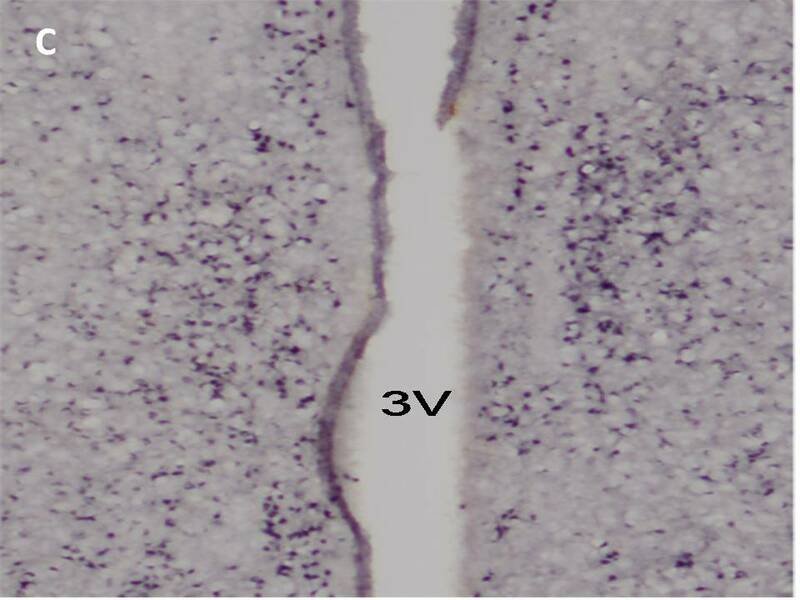 (f, g) A hippocampal neuron 7 days after electroporation of 1:1 mixture of T∞1X4-eGFP and T∞1X4-mRFP1. 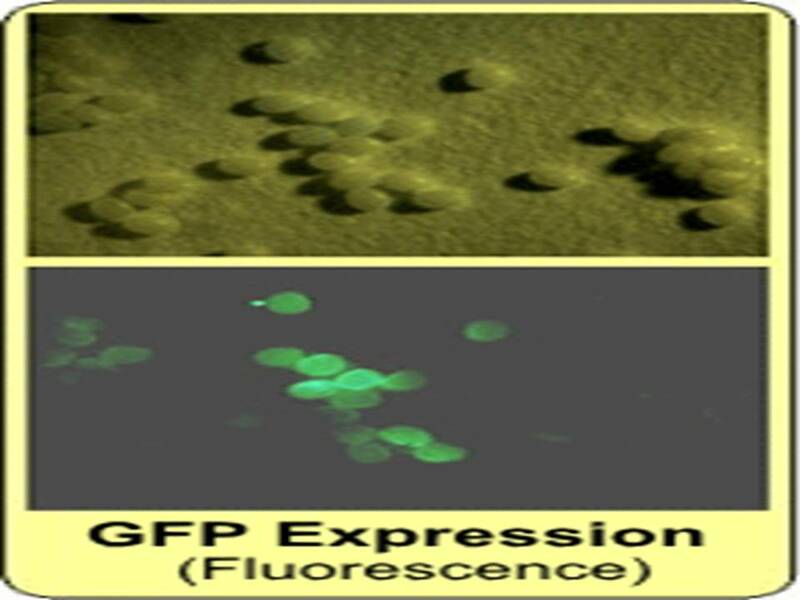 Both eGFP fluorescence (f) and mRFP1 fluorescence (g) can be observed in a single cell. 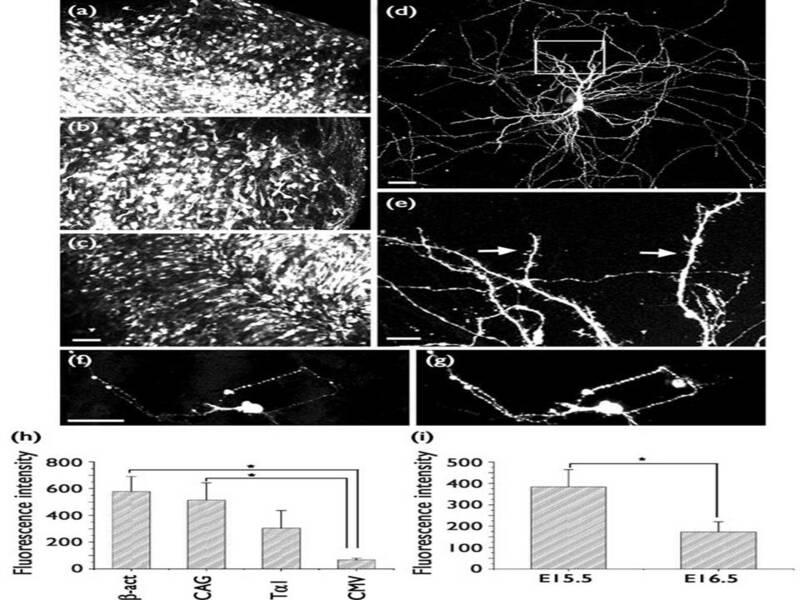 (h) Relative fluorescence intensity of hippocampal tissue fragments after electroporation of eGFP-expression plasmids with four different promoter sequences. The tissue fragments were maintained in culture for 4 days, fixed and observed under a confocal microscope. 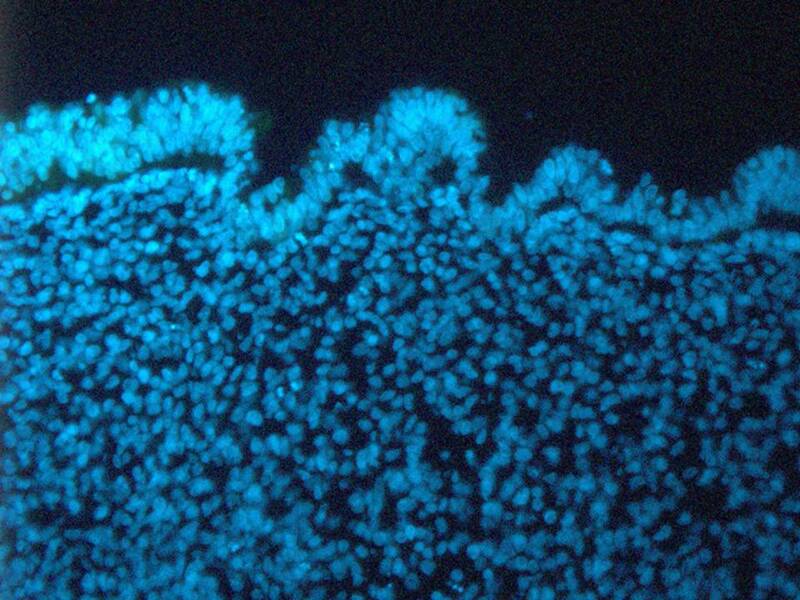 Fluorescence intensities per unit area of the tissue fragments were determined. 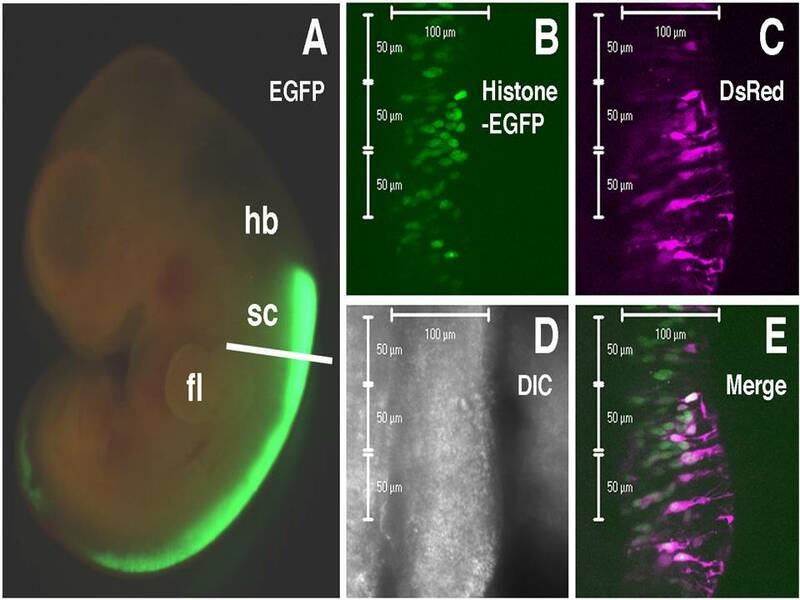 (i) Relative fluorescence intensity of hippocampal tissue fragments isolated at two different developmental stages and electroporated with ß-actin-eGFP. 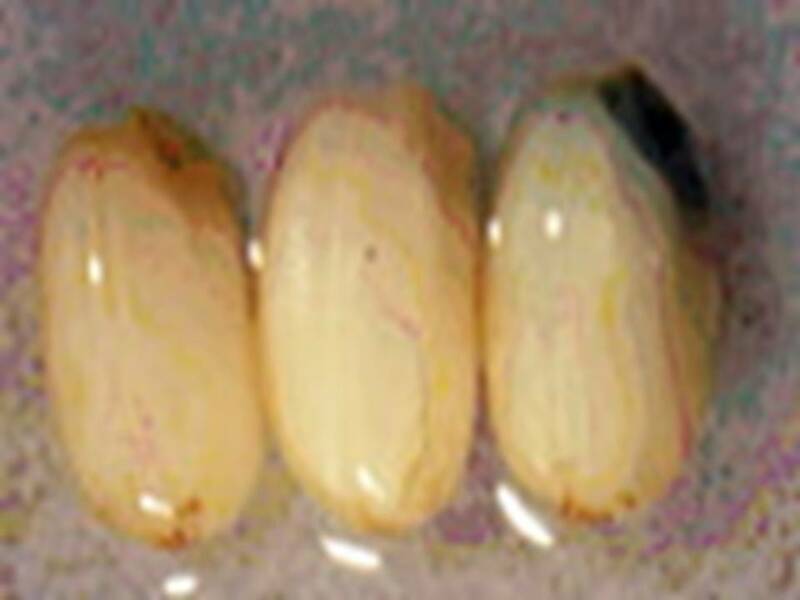 Tissue fragments were maintained for 4 days in culture and subsequently fixed. 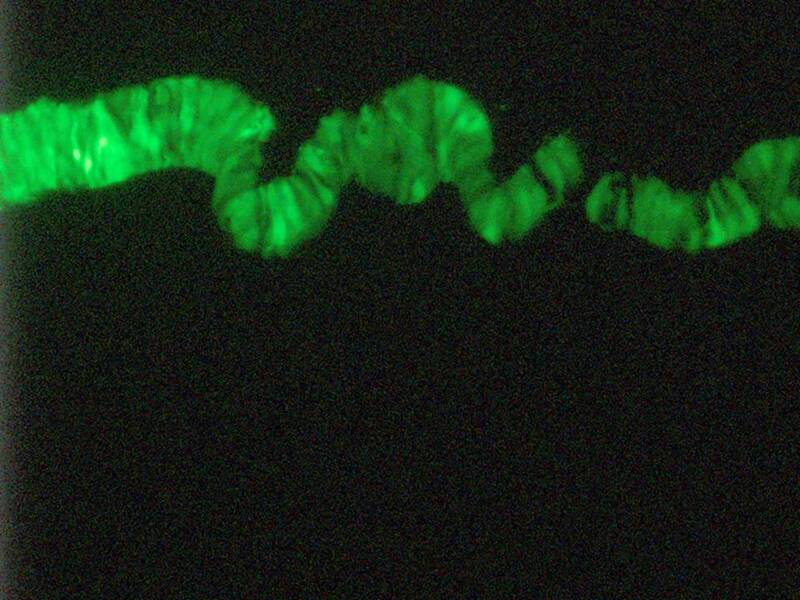 Fluorescence intensities were measured using a confocal microscope. Bars = 50µm (a-d, f, g); 10µm (e). 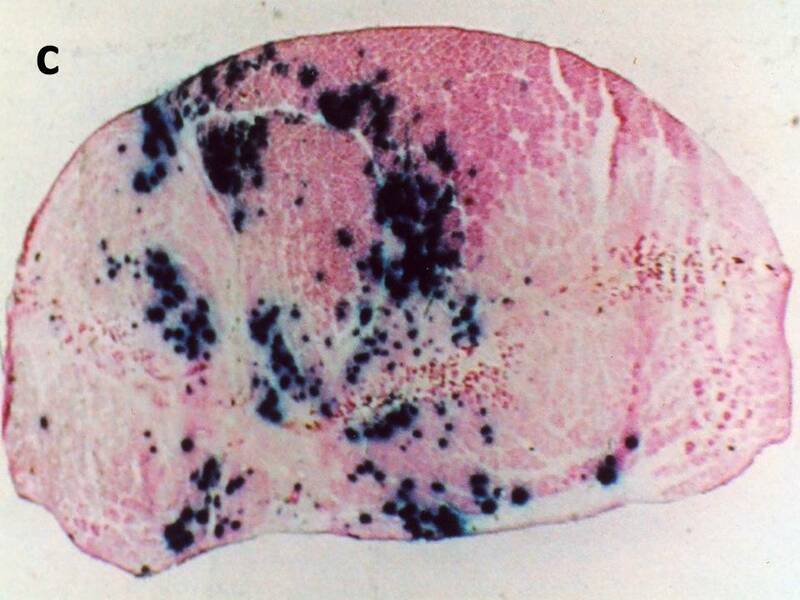 Figure A: EGFP expression in the medial preoptic nuclei of a female rat examined 4 days after bilateral electroporation at 10 weeks of age. 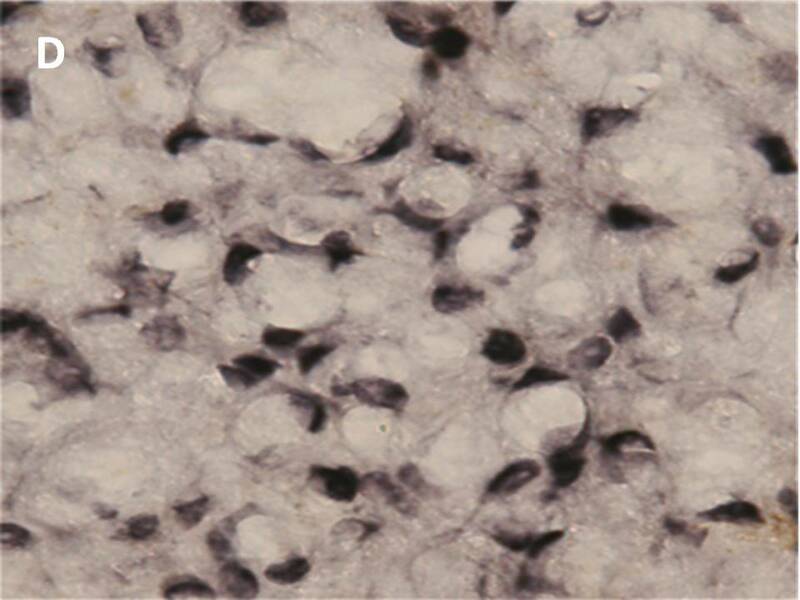 (An asterisk indicates the trace of the positioning of the electrode) Figure B: EGEP-positive cells (high magnification of Fig. A using a 60x objective lens) EGFP fluorescent signals are observed in the perikarya. . Figure C: Estrogen receptor α immunoreactivity in the medial preoptic nuclei and the periventricular nuclei of an adult female rat. 3V: third ventricle Figure D: Estrogen receptor α-positive cells (high magnification of Fig. C using a 60x objective lens). Estrogen receptor α immunoreactivity is prominent in the nuclei. .
Schematic illustration showing the in vivo electroporation method. (1) DNA injection into subretinal space (2) Electroporation . 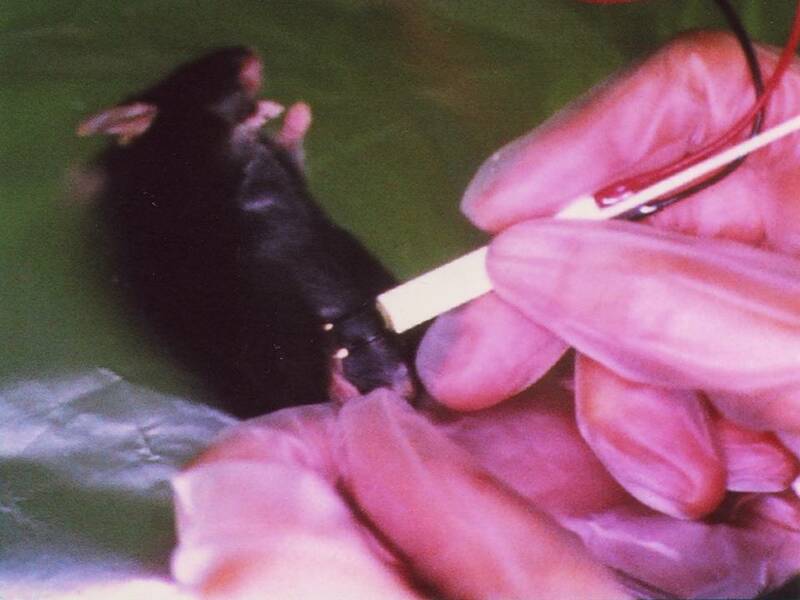 Tweezer-type electrodes (3) are placed to hold the head of newborn (P0) rat or mouse (4). 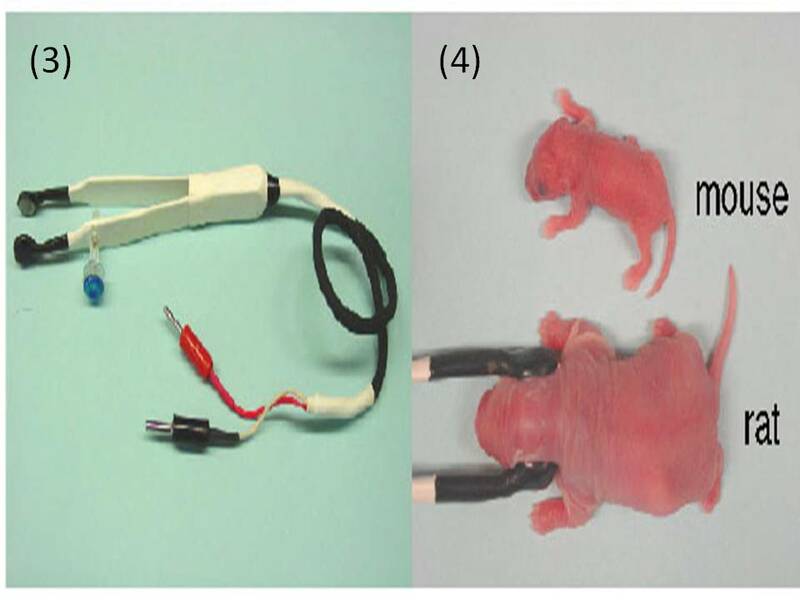 In vivo electroporated rat retinae harvested at various developmental stages. 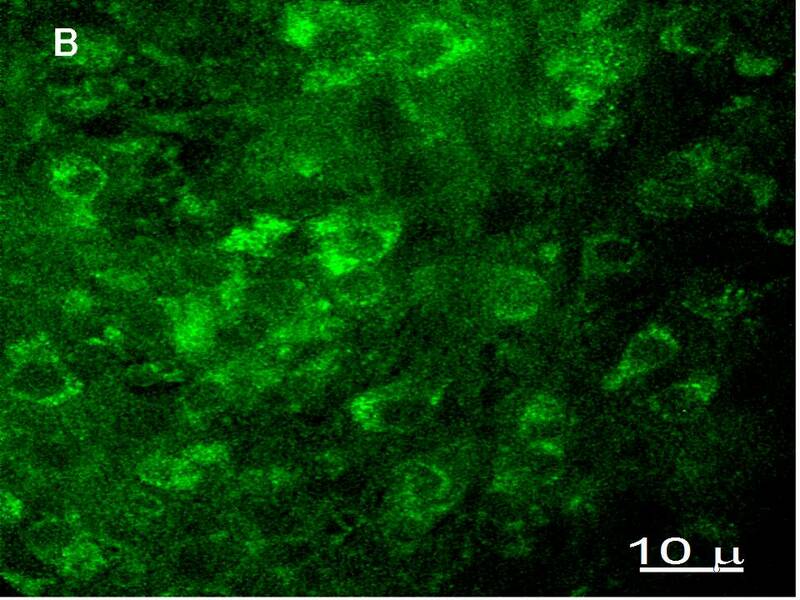 (A) Whole-mount preparation of rat retina in vivo electroporated with pCAG-GFP at P0 and harvested at P21. Pictures were taken from the scleral side. 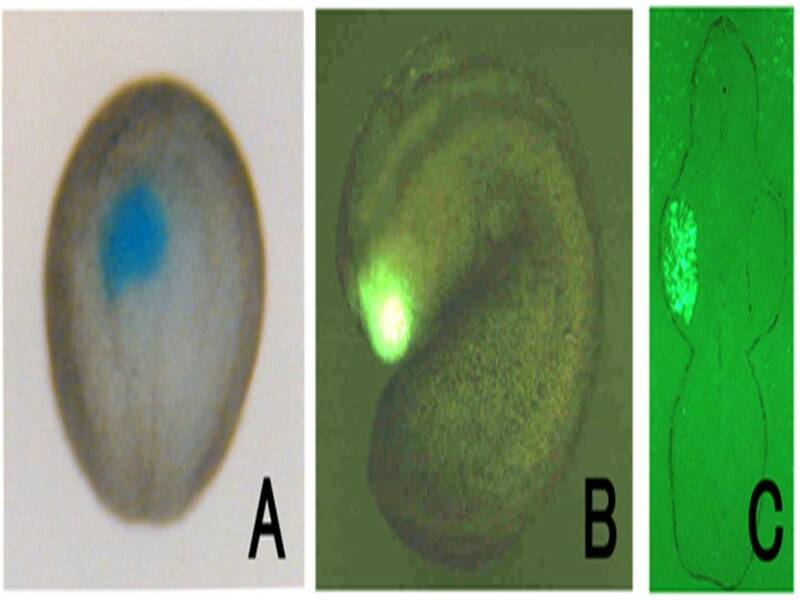 (B) Rat retinae in vivo electroporated with pCAG-GFP at P0 were harvested at P2(d-f ), or P5(g-i), and cryosections were prepared. Cepko laboratory, Department of Genetics and Howard Hughes Medical Institute, Harvard Medical School; Takahiko Matsuda . 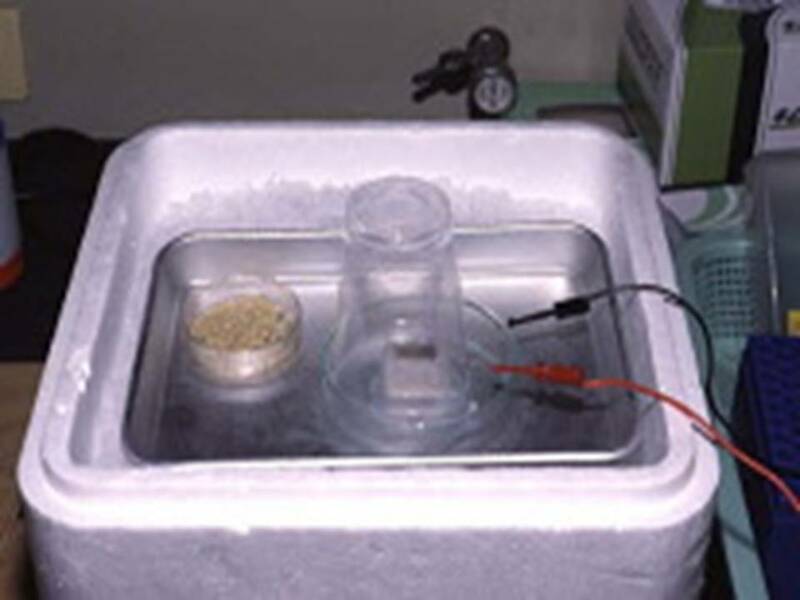 Electric pulses were delivered using an electric pulse generator (Square Wave Electroporator CUY21EDIT; Nepa Gene Co., Ltd.). Electrodes consisted of a pair of stainless steel needles of 5 mm in length and 0.4 mm in diameter, fixed with a distance (gap) between them of 3 mm or 5 mm (Nepa Gene Co., Ltd.) . X-gal Staining The tibialis anterior muscles were fixed in cold 4% paraformaldehyde in PBS for 3 h, then washed in PBS for 1 h, and stained at 37˚C for 18 h in the presence of 1mM X-gal to detect E. coli ß-galactosidase activity. For transverse sections, muscles were embedded in O.C.T. compound and frozen in dry ice-acetone. 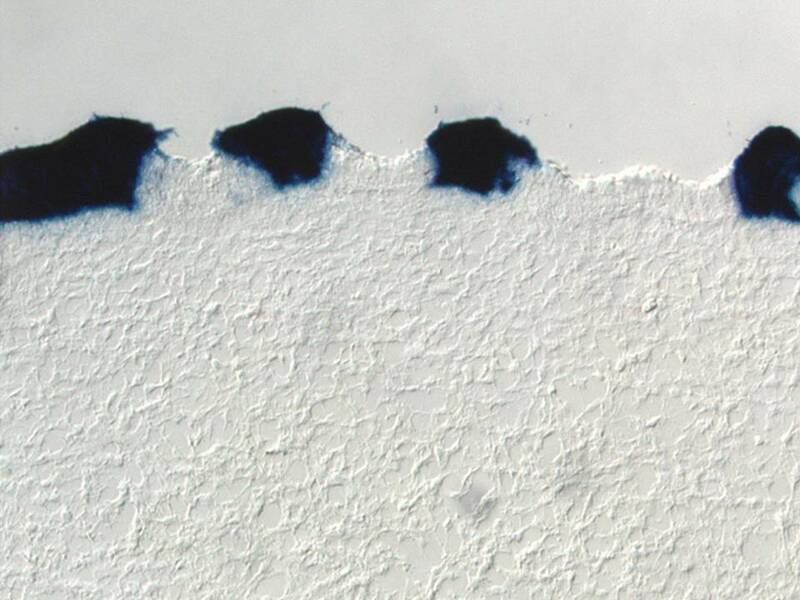 Serial sections (15 µm thick) were sliced with a cryostat and placed on slide glasses coated with 3-amino-propyltriethoxysilane. . . . . . 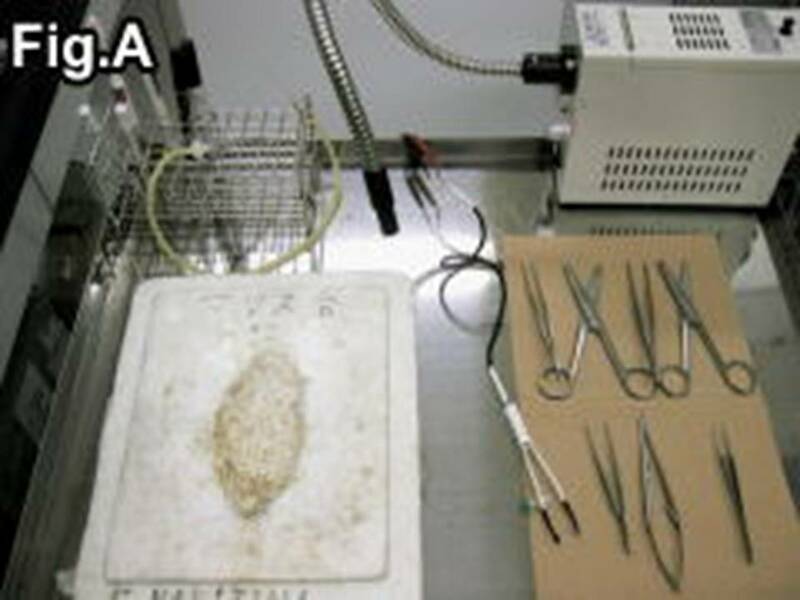 The slices were fixed in 1.5% glutaraldehyde for 10 min at room temperature and then washed three times in PBS. 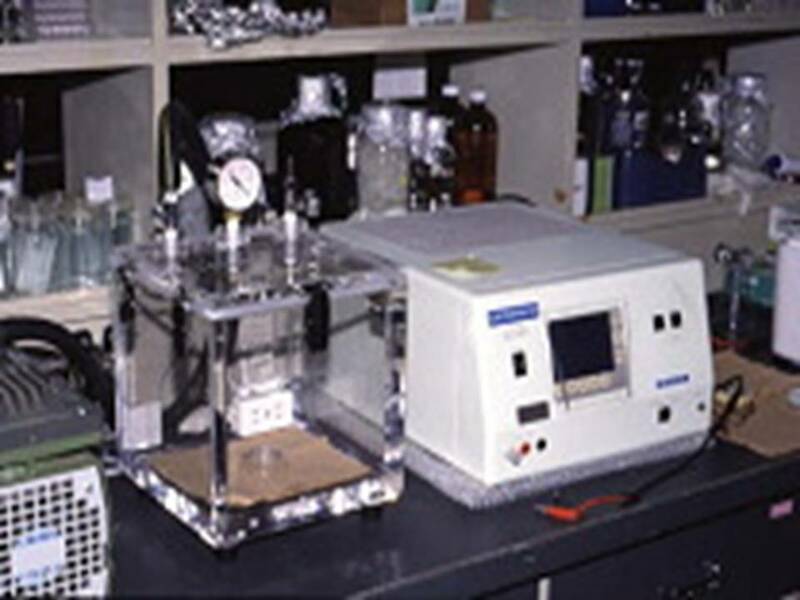 Samples were then incubated at 37˚C for 3 h in the presence of 1 mM X-gal. 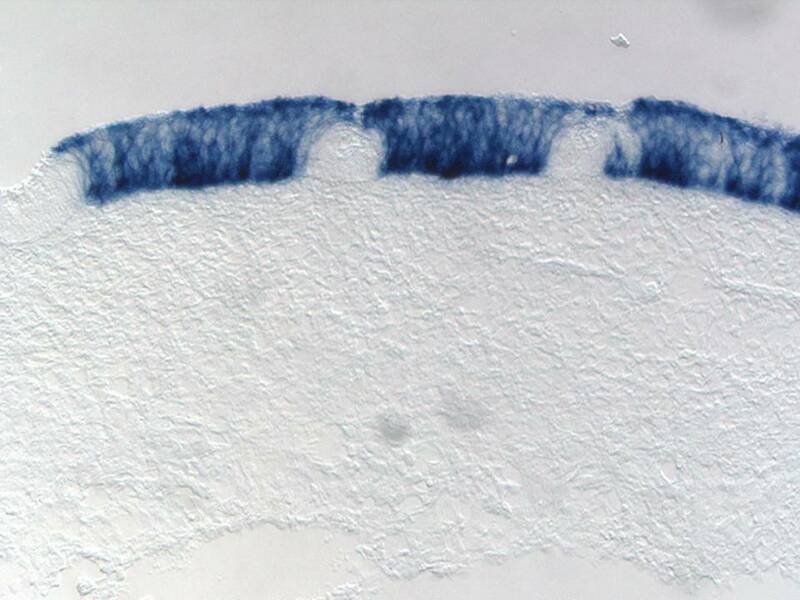 The muscle sections were counterstained with eosin. 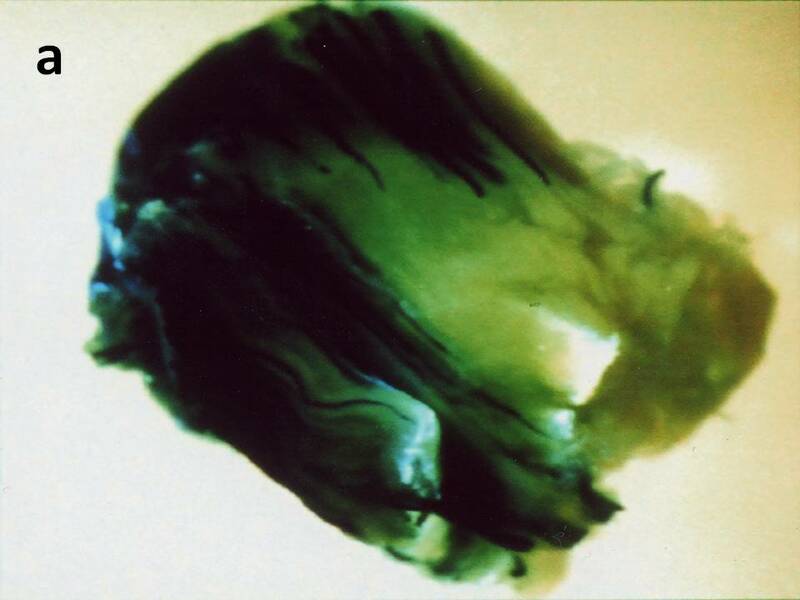 The control muscle (without electropul-sation) showed only a small number of stained muscle fibers. 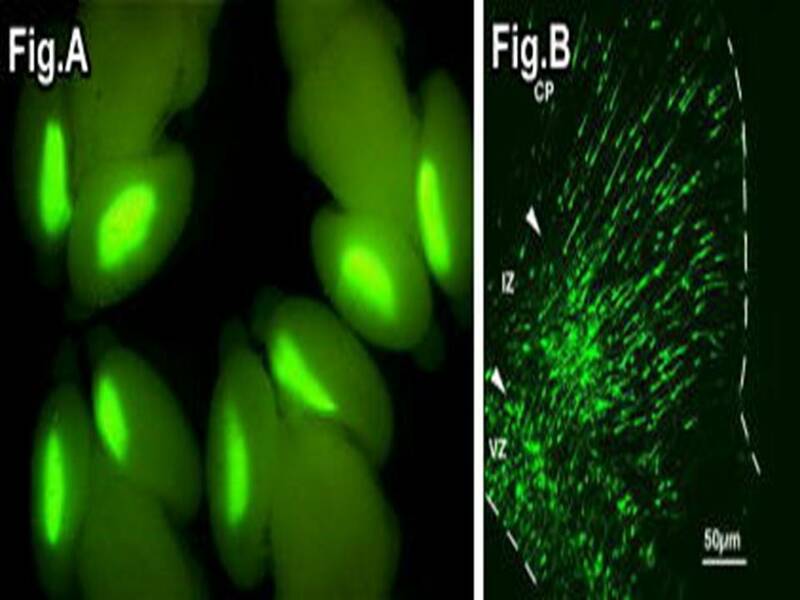 Electroporation increased both the number of positively stained muscle fibers and the density of staining..
ß-Galactosidase expression on d 1 (A) and d 7 (B) after the pCAGGS-lacZ transfer with electroporation at 18V. 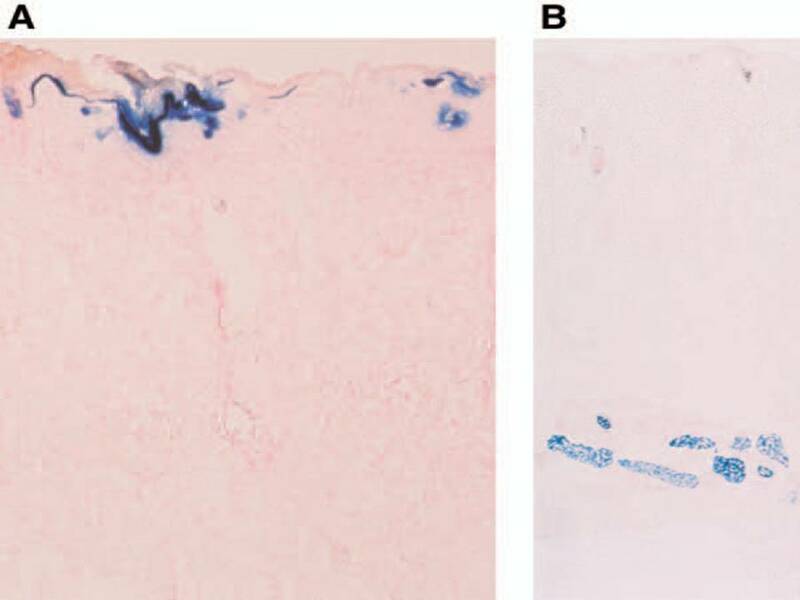 ß-Galactosidase was expressed in the upper most cell layers (horny, granular, and prickle cell layers) of the epidermis on d 1 (A), and in the subcutaneous muscle layer on d 7 (B). 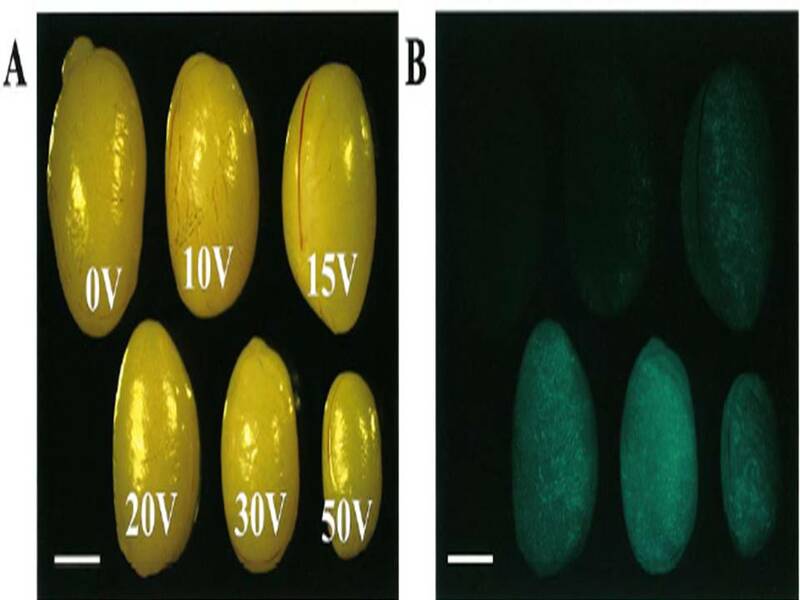 Stereomicroscopic views of transfected testes charged with various voltages and observed under visible (A) or excitation (B) light after 5 wk. Voltage is indicated on each testis (A). Loss of testicular weight 5 wk after electric charge in 12-day-old testes (C). All values are means ± SD (measured number of testes charged with 0, 10, 15, 20, 25, 30, 40, and 50 V are 4, 4, 4, 12, 12, 15, 10, and 12, respectively). 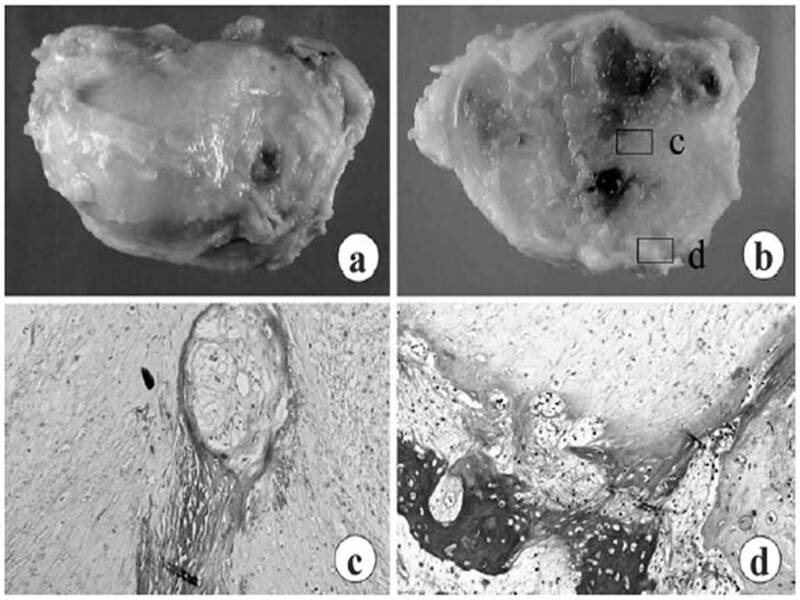 Cross-sections of a testis at 5 wk after being charged with 50 V, observed with fluorescence microscope under excitation light (D, left), followed by counterstaining of the same section with hematoxylin (D, right) or another section just stained with hematoxylin (E). 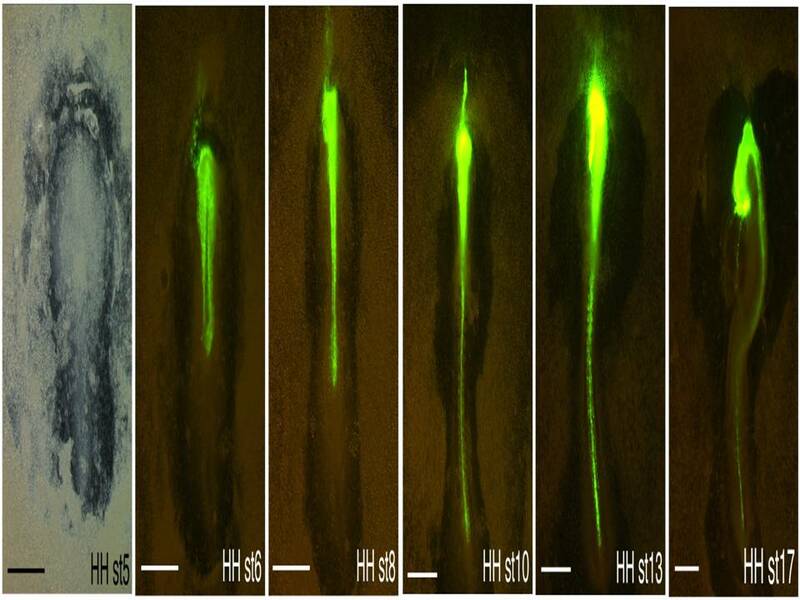 In higher voltage charged testes, luminal enlargement of seminiferous tubules (D) or complete degeneration of seminiferous tubules under the capsule (D, left) was observed. 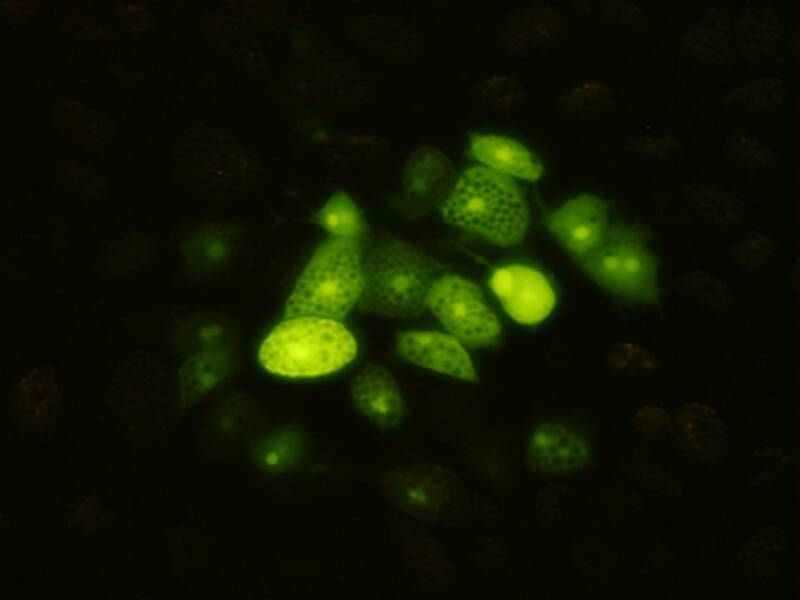 In these testes, many fluorescence-positive Sertoli cells were identified easily (E, right), like in 20V charged testes (Day 35). 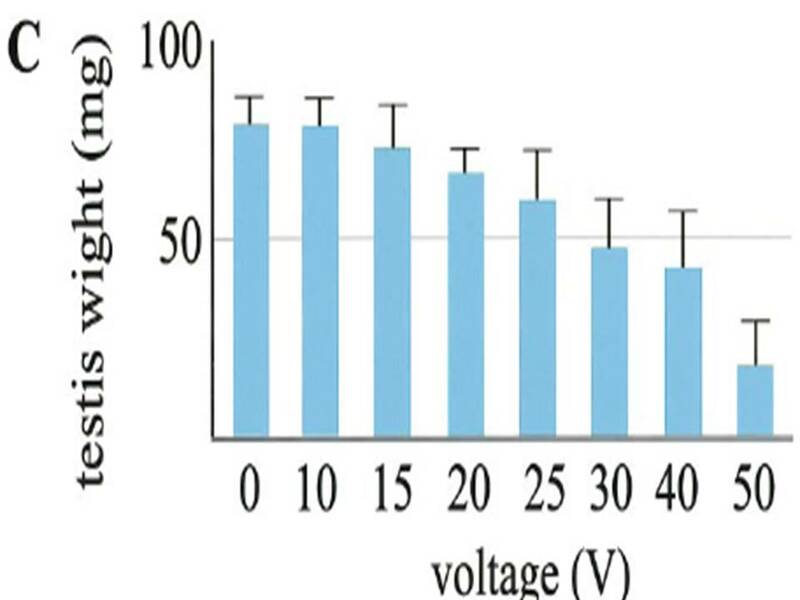 Bars = 2mm (A, B) or 100μm (D, E). .
(A) shRNA expression vector is electroporated as shown above. (B) Select target DNA sequence of 19 to 21 mer. Sense and antisense sequence were linked to a nucleotide spacer as a loop and put into expression vector that is driven by U6 or H1 promoter. Commercially available expression vector that dreives expression by mouse U6 promoter is effective in chick embryos. 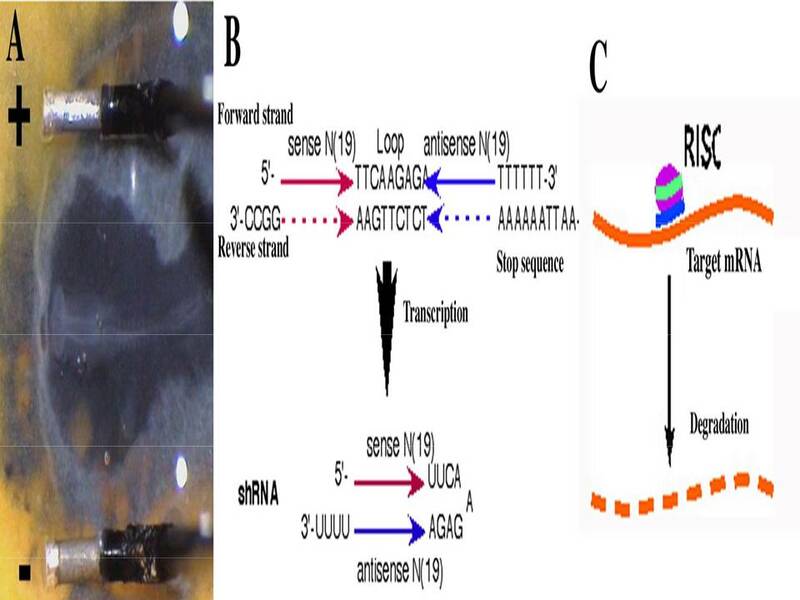 (C) After transcription, hairpin is digested to form siRNA, and siRNA forms RISK (RNA-induced silencing complex) to degrade the target mRNA. .
A: Schema illustrating the system B: Hamburger and Hamilton (HH) stage 4 chick embryo with DNA solution injected to the prospective neural plate region. DNA solution was colored with a FastGreen dye. 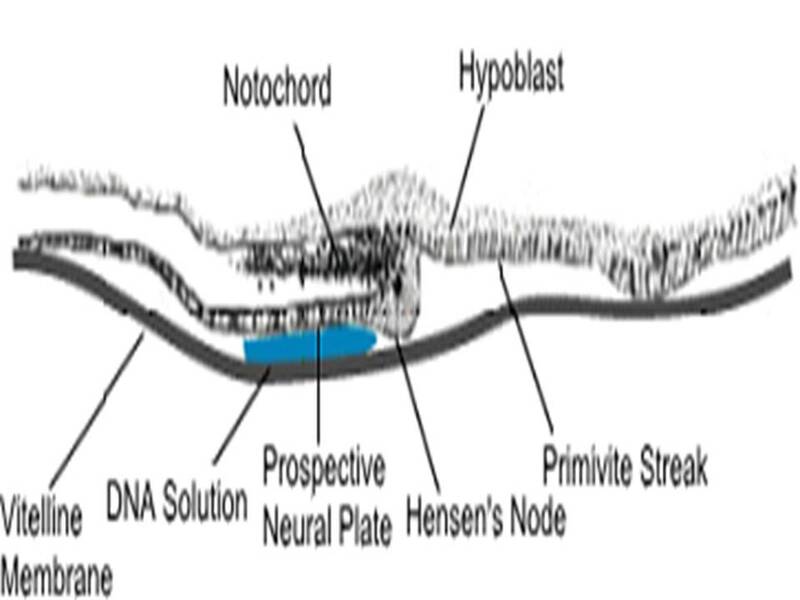 hn: Hensen’s node, ps: primitive streak, ao: area opaca, ap: area pellucid C: Schema illustrating the location of DNA solution between the vitelline membrane and the ectoderm. . Experimental Procedure1. Dissect an embryo using a paper ring (dried filter paper) out of the egg. 2. Rinse gently to remove excess yolk, and place the embryo onto the platform of the cathode chamber. 3. Inject DNA solution into the space between the ectoderm and vitelline membrane using a glass pipette (for introduction to the ectoderm derivatives). 4. Adjust the target site right onto the cathode, and set the anode above it. Set the electrode distance at 5mm. 5. 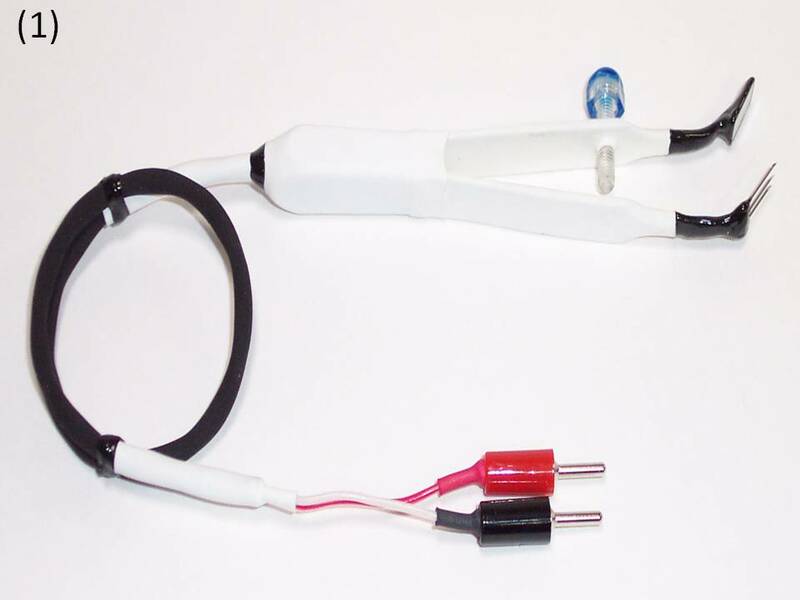 Deliver electric pulses (10V, pulse on 50ms, pulse of 100ms, 5 pulses) using a CUY21 electroporator. 6. Place the specimen on an agarose-albumin plate, and incubate at 39°C. .
GFP expression becomes detectable by HH6 (about 5 hours after electroporation) in the neural plate, which spreads throughout the central nervous system at HH17. Scale bar: 1mm. .
Based on the fate map of the chick epiblast, transgenes can be introduced to the somites (A, E), hematopoietic system (B, F), notochord (C, G), or lateral plate mesoderm (D, H). E-H are the high power views of A-D, respectively. 1. Cut open the proventriculus with small scissors and transfer the tissue to PBS(-) solution.. . 2. 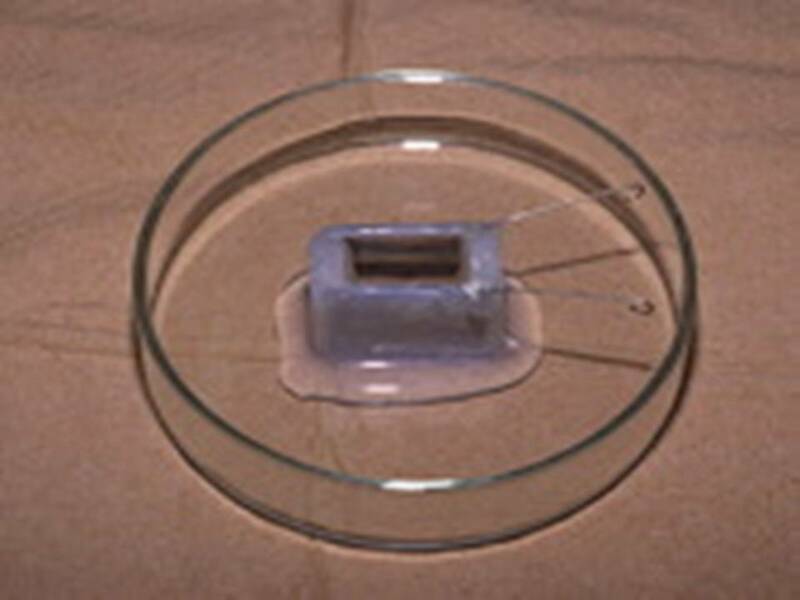 Cut the agarose gel with a small well (we use minigel for the separation of DNA) into a piece of appropriate size and put it into the electrode well. . . 3. 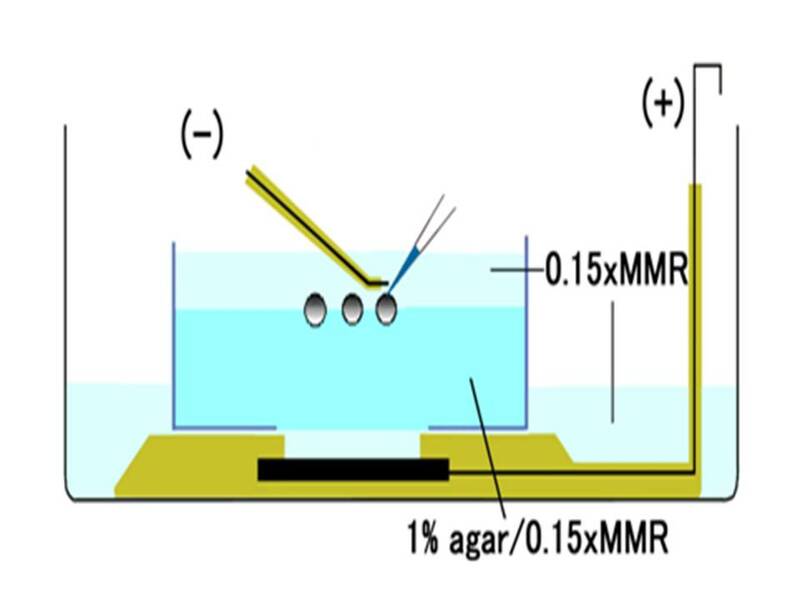 Fill the well of electrode with PBS(-) and the well of agarose gel with DNA solution (12-15µl). Put proventriculus tissue into the well with it’s epithelial side towards the cathode. Two or three samples can be put together. . . 4. Apply pulses of 30V for 15 times with pulse length of 50ms, and interval time of 75ms. Remove agarose gel immediately and wash it in Tyrode’s solution. Then take out the tissues from the gel and wash them well in Tryode’s solution. The tissues can now be cultivate organotypically.
. (Fig. 1) Two days after the introduction of the vectors. 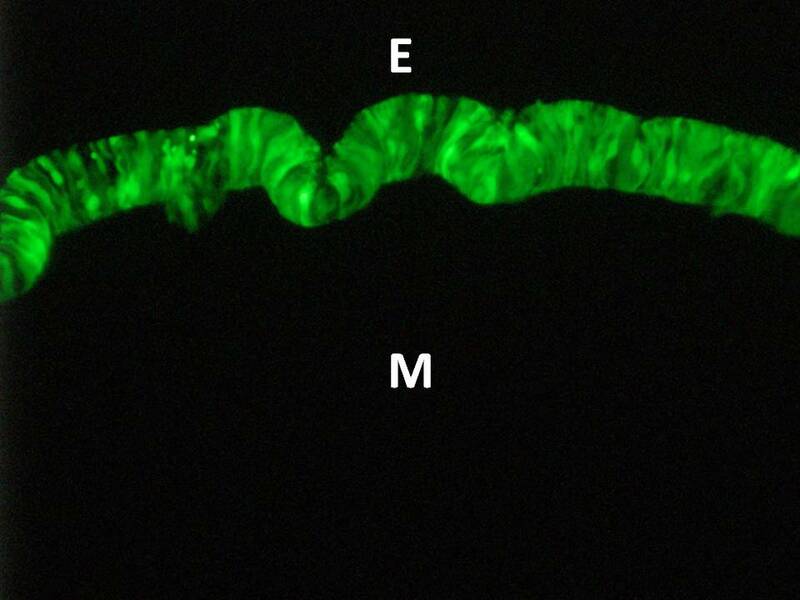 Expression of GFP is observed only in the epithelium (E, left), not in the mesenchyme (M). 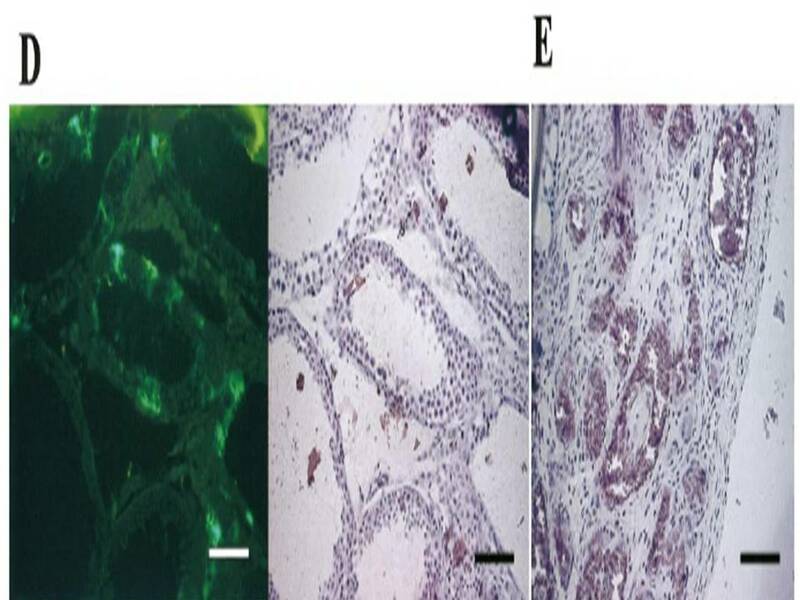 cSP gene, a luminal epithelium marker, is expressed normally indicating that the electroporation is not harmful for the normal development of the stomach (right). 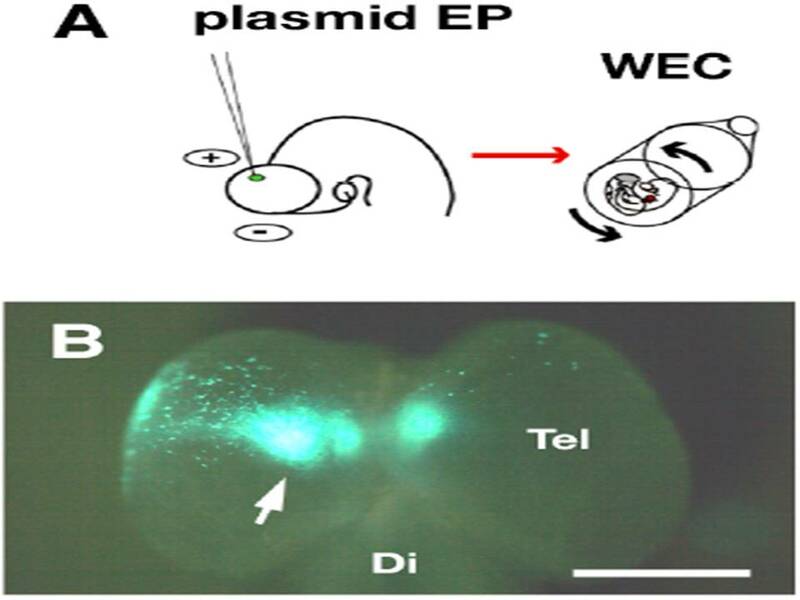 Central figure shows DAPI staining of the explant. . .
(Fig. 2) Three days after the introduction of the vectors. 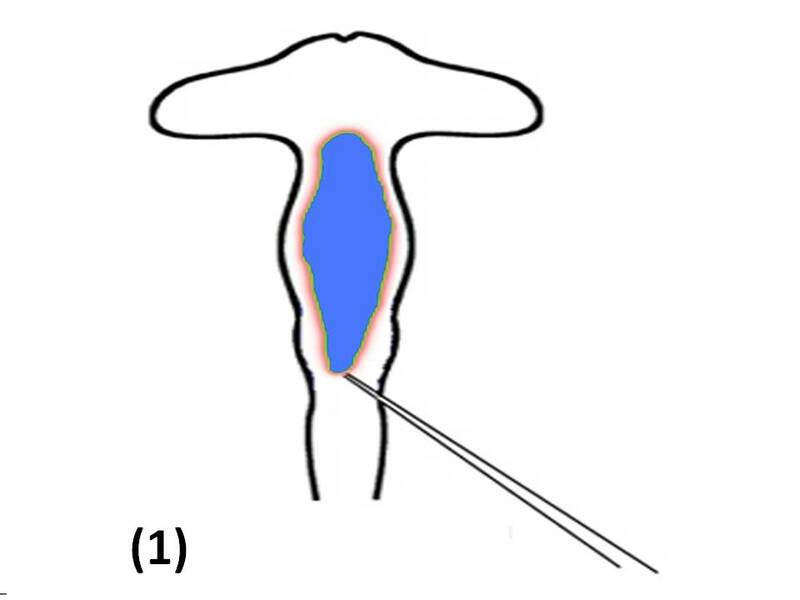 Small glands are already formed where cSP is not expressed. 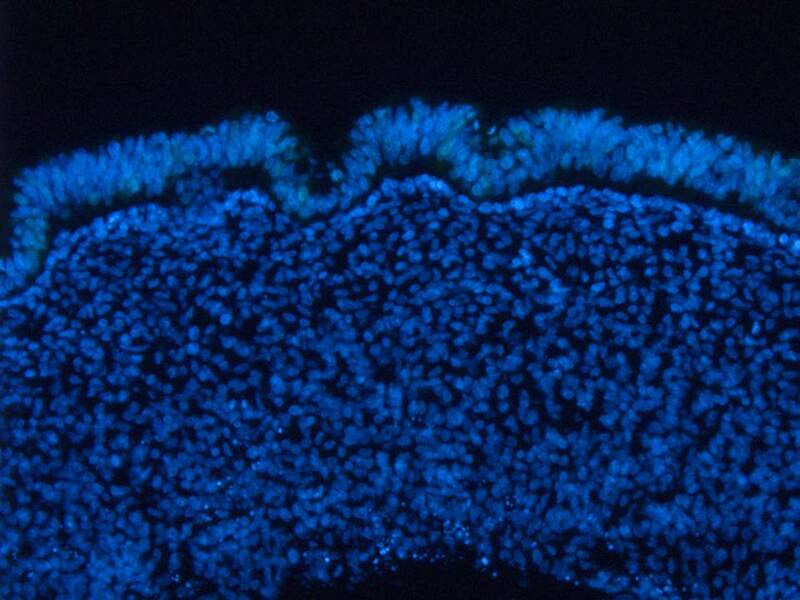 GFP protein can be found almost all epithelial cells of glandular and luminal epithelia, indicating that the efficiency of electroporation is very high. 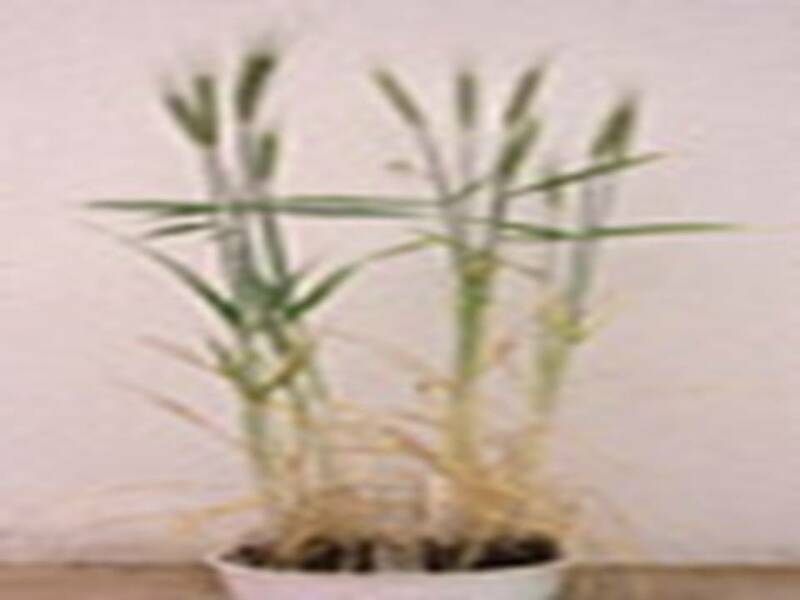 Fertile transgenic plants were regenerated and self-fertilized seeds were obtained in rice and wheat. 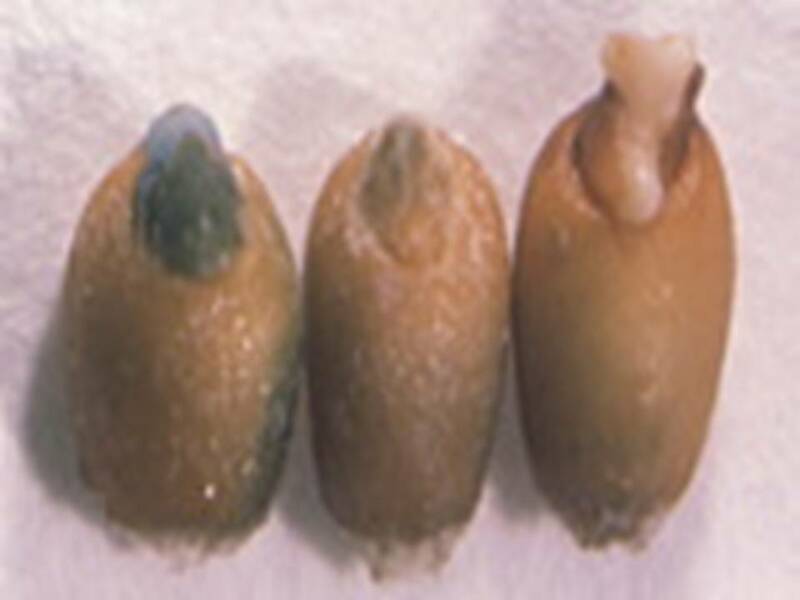 Transgene integration was confirmed by Southern hybridization. Transmission of the transgene into the next generation (T1) was indicated by PCR analysis. 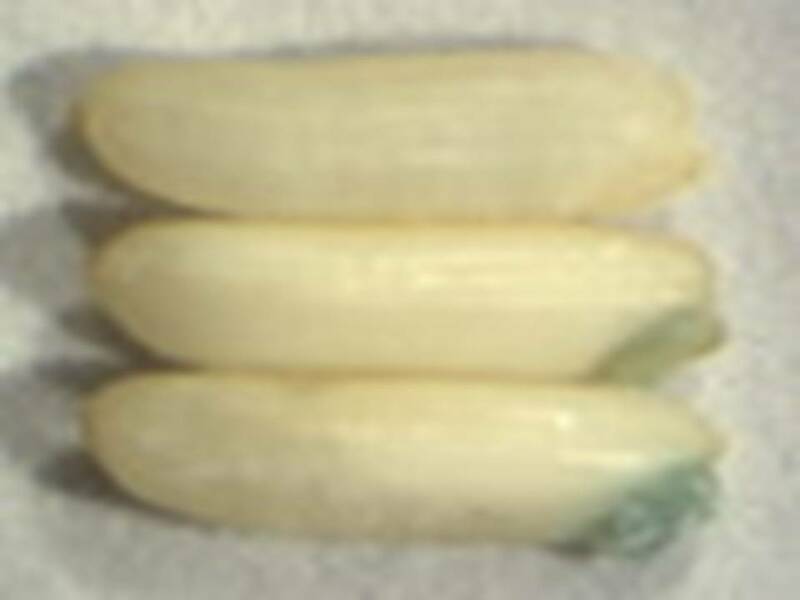 Transient gene expression was observed in several plant species and silk worm eggs. A) The necks of honeybees that had settled in the tube were fixed in place by inserting two U-shaped plastic sheets for surgical ease and later release. 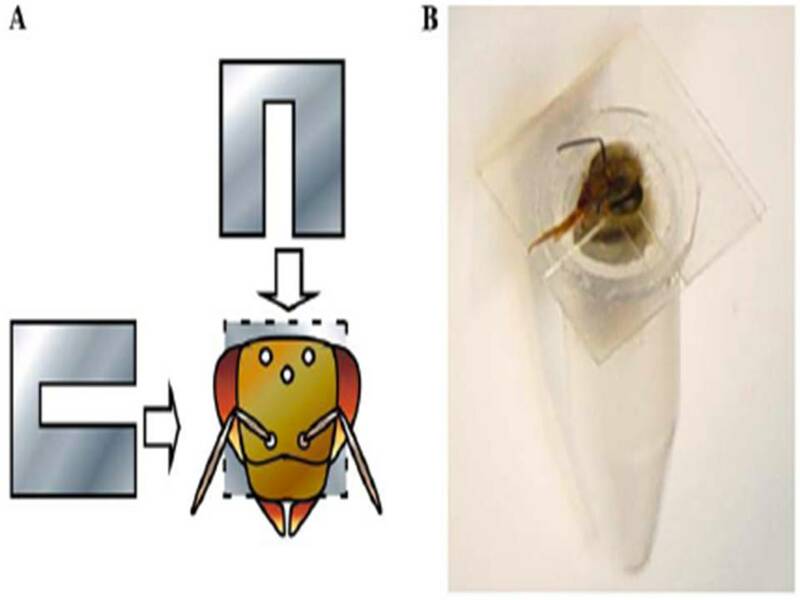 B) A honeybee settled in the tube with her neck fixed prior to the operation.
. C) Schematic representation of the micropipette and electrodes placed in the honeybee brain. Purple indicates micropipette filled with DNA solution, blue indicates electrodes. 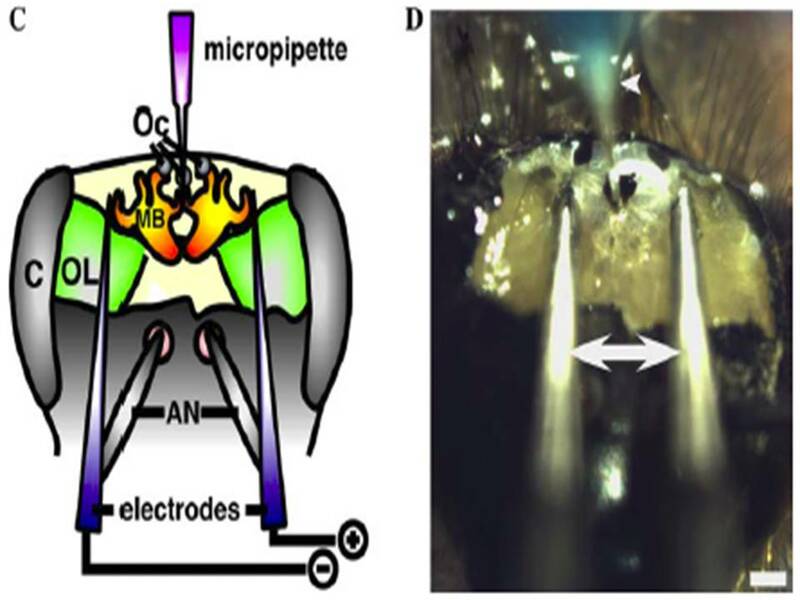 AN, antennae; C, compound eyes; MB, mushroom bodies; Oc, ocelli; OL, optic lobes. 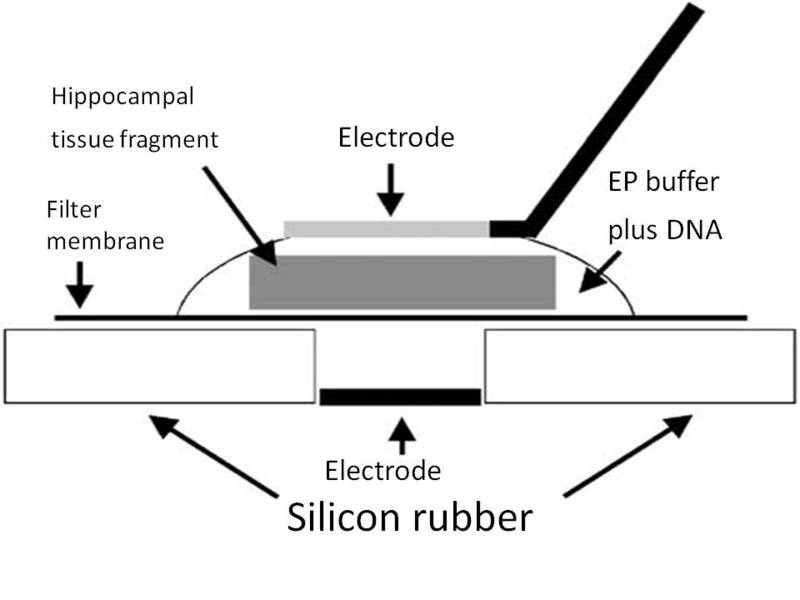 D) DNA injection and electroporation with needle electrodes. Arrows and arrowhead indicate electrodes and micropipette for DNA injection, respectively. 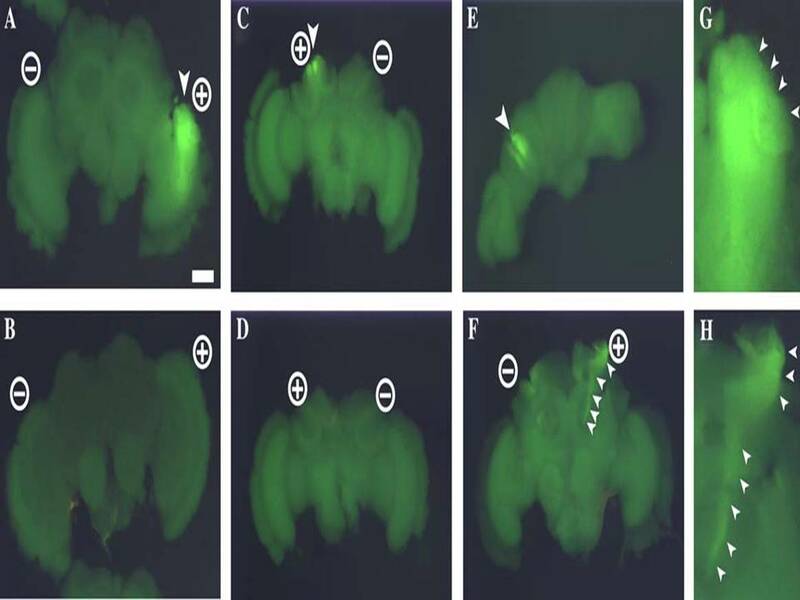 Scale bar: 300µm. .
Fluorescent images of electroporated honeybee brain at 50V, targeting the optic lobe (A, B) and mushroom bodies (C-F).Fluorescent signals were detected around the anode position in the brain electroporated with GFP-expressing plasmid driven by the CMV promoter (A, C, E, F) and not in those electroporated without plasmid (B, D). 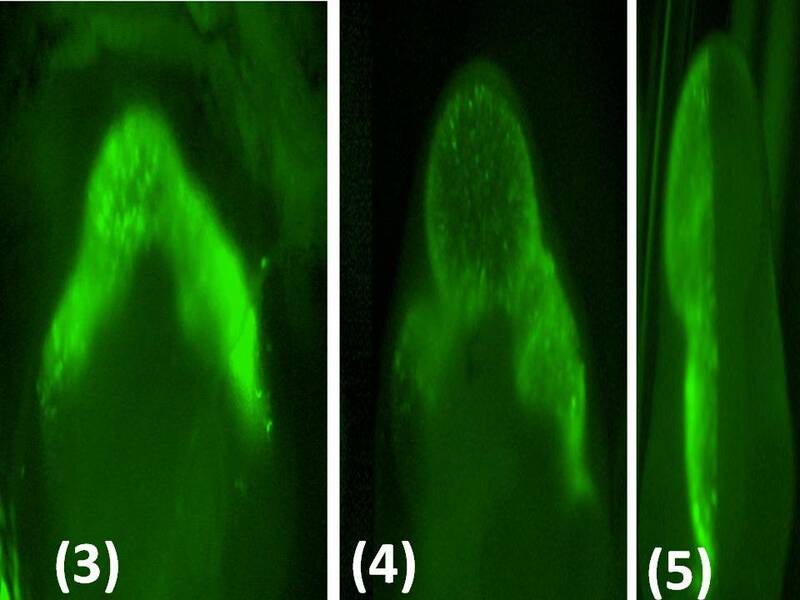 (G, H) Magnified views of GFP-expressing areas shown in (A) and (F), respectively. Positions of electrodes are indicated by circles containing + or -. 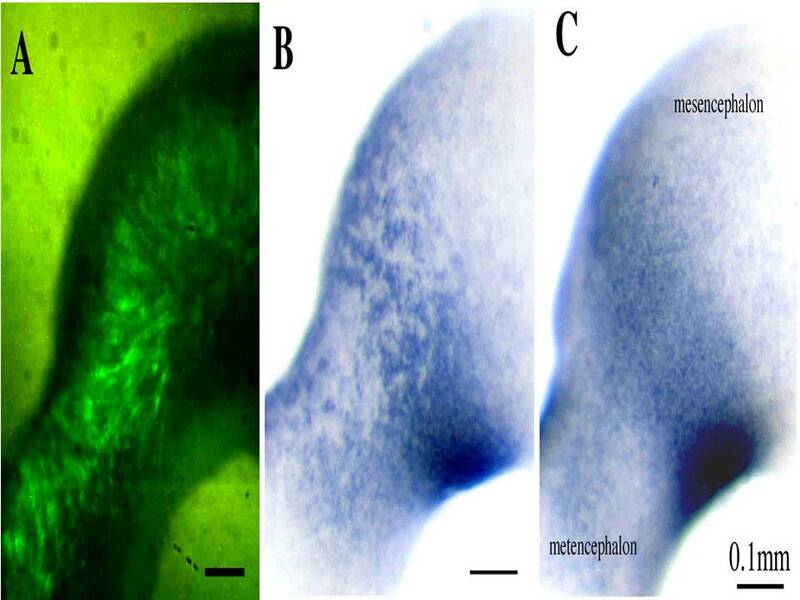 Arrowheads indicate the regions in which fluorescence was detected (A, C, E, G) and neural projections from mushroom body cells (F, H). Frontal view (A, B, F, G, H), rear view (C, D), and top view (E). Panels (C) and (E) show different views of the same brain. a. Proximal phalanx of the middle finger is swollen.. b. 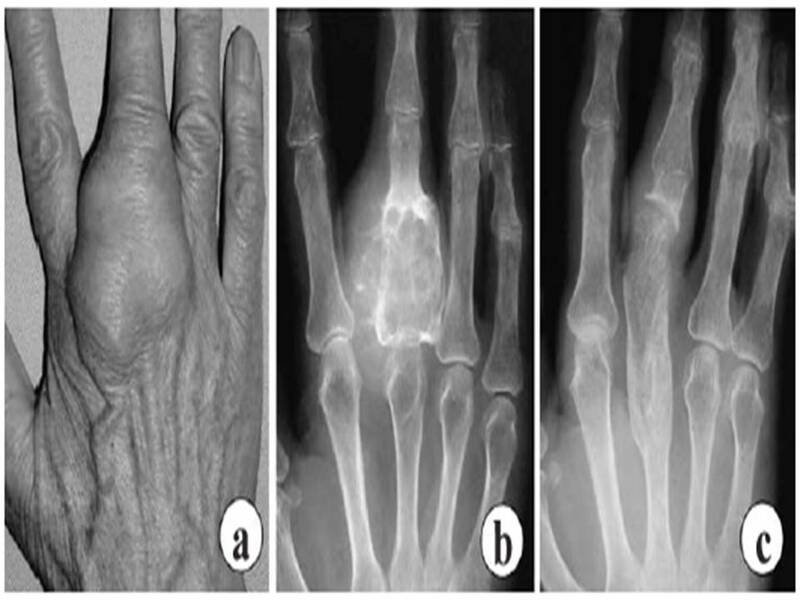 Expanding radiolucent mass in the proximal phalangeal bone. . c. No recurrence was seen even 3 years after treatment. 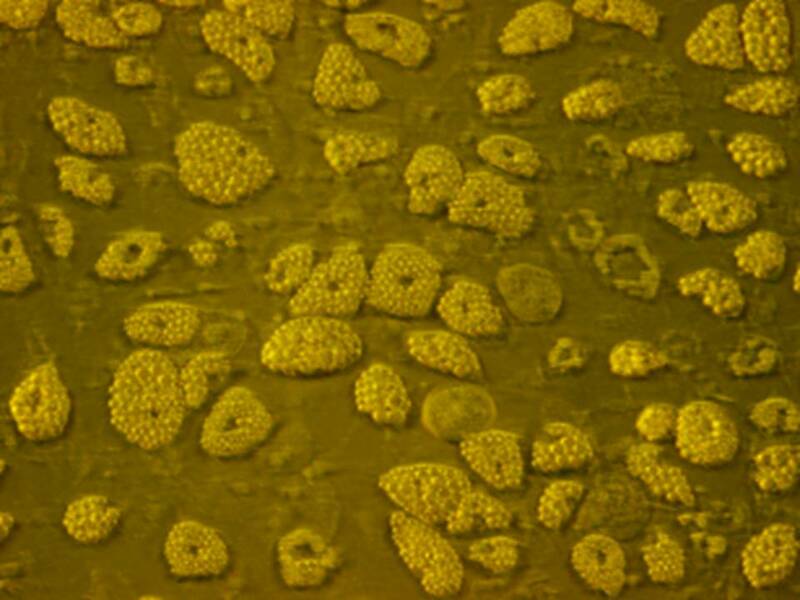 a) Cells varying in size and shape with nuclear atypia and multivesicular vacuolation of cytoplasm. . .
. Electrode and electroporation. a. Stainless steel 3cm x 5cm electrodes . 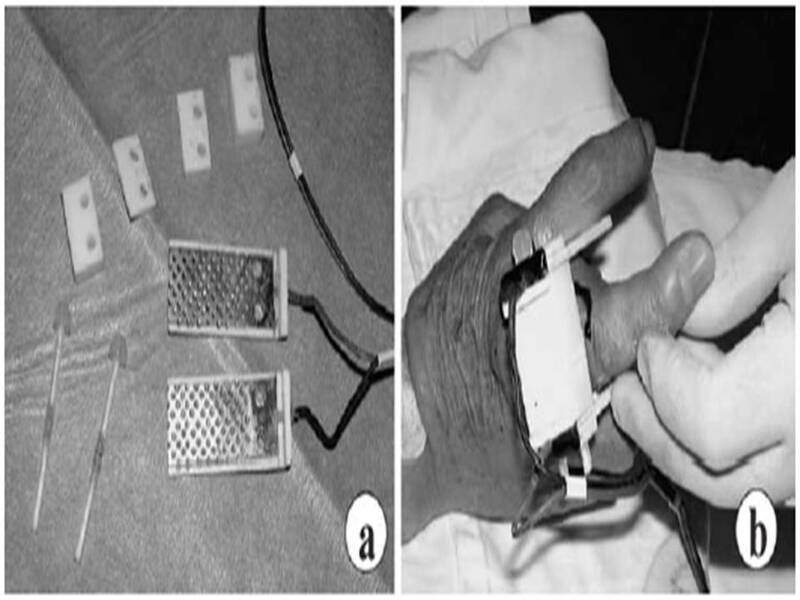 b. Electroporation with two parallel electrodes placed on opposite sides of the tumor . 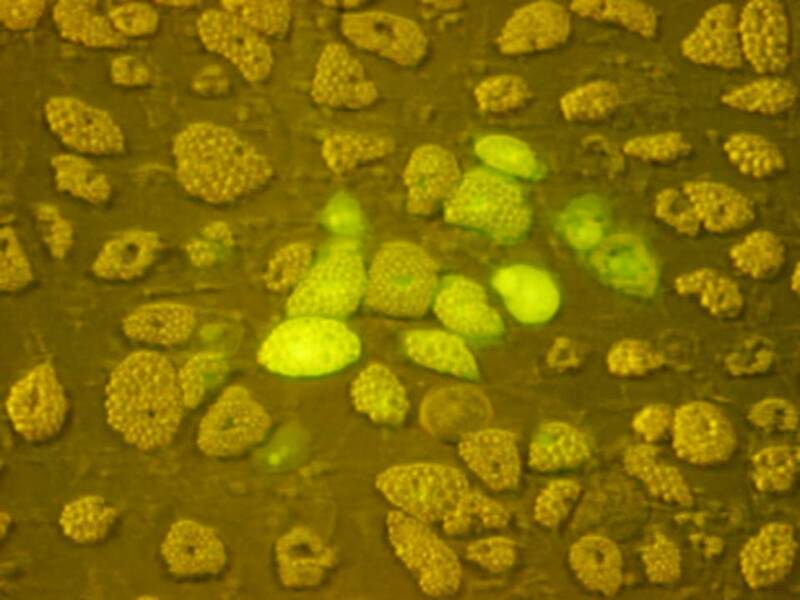 Introduction of fluorescence dye (Lucifer Yellow) to rat visceral fat cell .